We can go literally for years without any special yearning to watch gymnastics, swimming, or beach volleyball. Yet every four years, like a periodic cicada, our inner fan emerges, and we are rapt before the summer Olympics. Of course, it is annoying to watch the same advertisements over and over, and listen to the commentators’ unhelpful hype and drivel. But the athletes are stupendous! It makes you proud to be part of the same species. 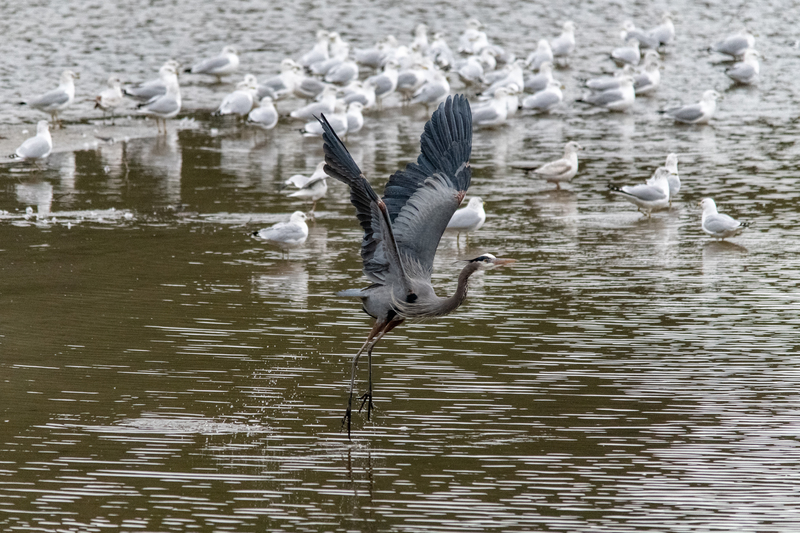 All that drive and dedication, for years and years, and then the ultimate mastery at the decisive moment. It makes you wonder how much more each of us might be capable of. 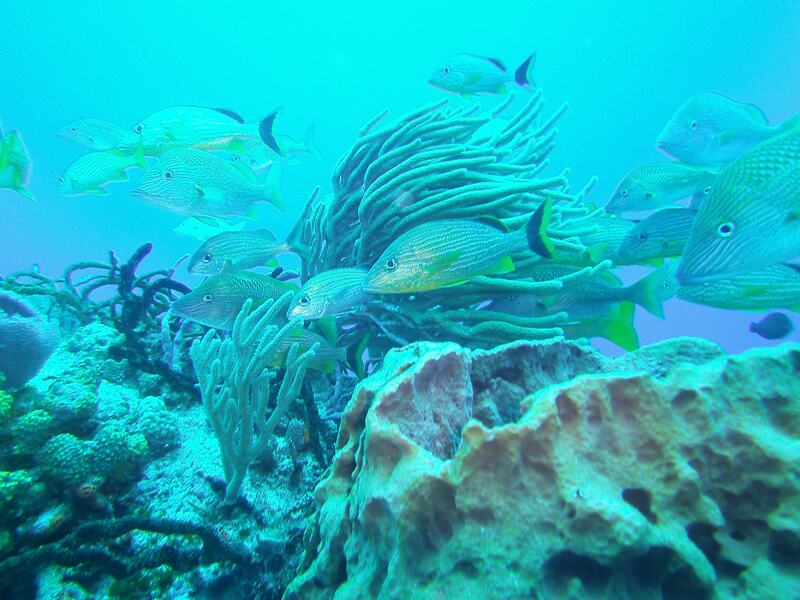 These photos are from our diving trip last week out of Wrightsville on the wrecks of the Gill and the Hyde. The water was murky — only 10 feet of visibility in places. 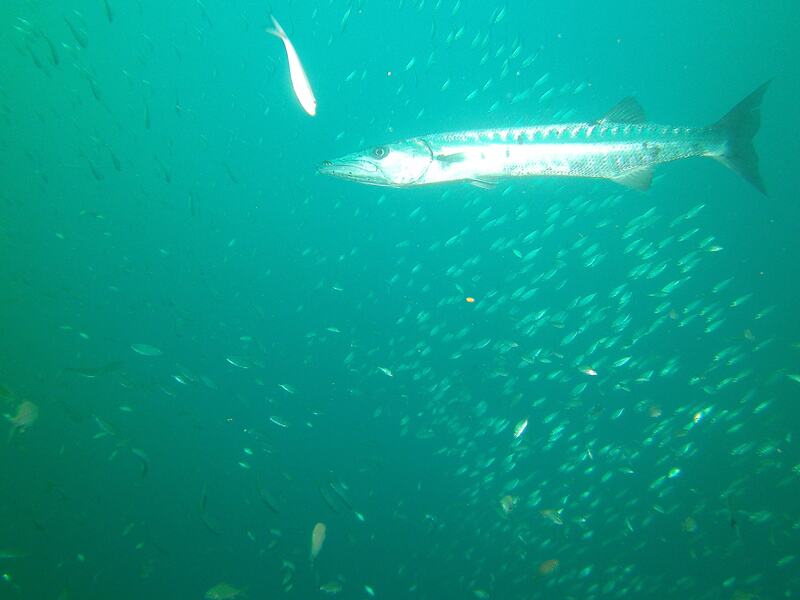 But we still saw a lot of life, including sand tiger sharks, barracuda, and lots of little fish. On the Hyde, about 80 feet down, I lost Sally and Gabe near the end of the dive, as can so easily happen in poor visibility. Then I couldn’t find the anchor line, which was the planned route back to the boat. My air was getting low, and it occurred to me that things might turn out really badly. But I surfaced in an orderly manner and found the boat close by, and family safely aboard. Last week I had my last piano lesson with Olga for a while, since her baby is soon to arrive. We worked on Liszt’s Sospiro and Chopin’s first Intermezzo. As usual, she made me listen more closely, and think about new musical possibilities. And as always, there were little technical issues to address. For a long time now, she’s been trying to make me practice each hand separately. The idea is to get out in the open the little rough spots, and also to allow for the hands to have separate personalities. I’ve quietly resisted this kind of practice, because it just isn’t that much fun. I’ve decided, though, to make a point of it. I like getting better. Last weekend Sally, Gabe, and I drove down to Wrightsville Beach for some scuba diving. We stayed in the Hilton Express in Wilmington, and went out to the wreck of the Hyde on Saturday, and the wreck of the Liberty ship on Sunday. It was good to gear up and get wet again. The Hyde is about twenty miles out of Wrightsville, and getting there took over an hour, in seas that were a bit choppy. With seventeen divers, the small Aqua Safari boat was quite crowded. Once the tanks were all connected to the gear, there was a ledge of about 5 inches to sit on. It was not comfortable. Several divers got seasick. 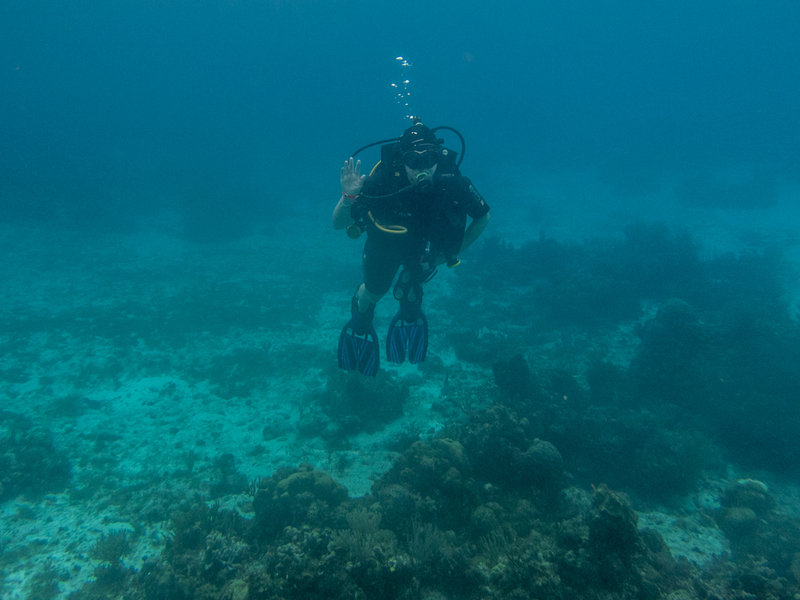 We did two dives on the Hyde, which was about 80 feet down. Visibility there was about 40 feet. 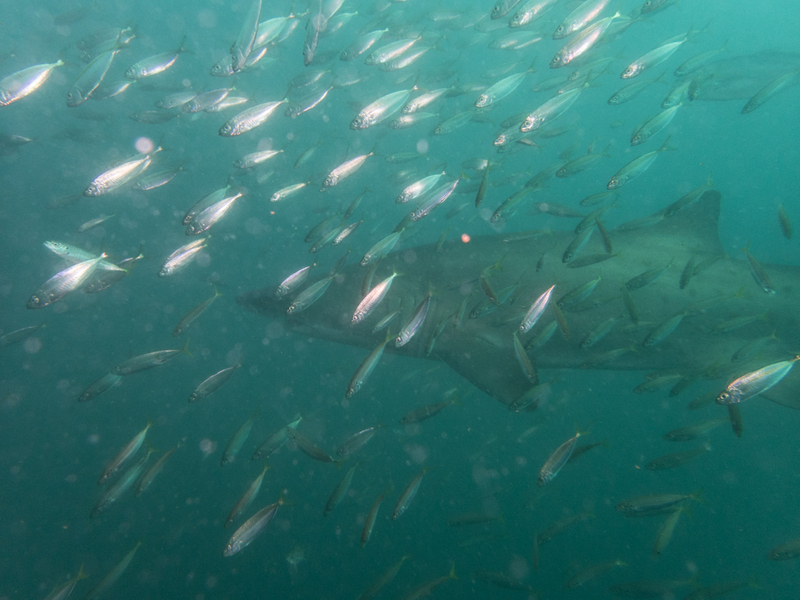 We saw sand tiger sharks, southern sting rays, barracuda, and hundreds of small fish. I tried out my new Olympus TG-4 camera with a PT-056 housing and two Sea and Sea strobes. Although I didn’t get any career photos, I liked the feel of the equipment, which much smaller and easier to work with than my last rig, and ran glitch-free. That evening we met up with my sister-in-law, Anne, and ate at a very nice restaurant called Manna. It was relatively upscale for Wilmington, with women in dresses and none of the men in tee shirts. Although there were no vegetarian entrees on the menu, our waiter explained that the chef could whip them up according to our directions or, if we preferred, according to his inspiration. I gave some directions based on the day’s non-meat accompaniments, and Sally decided to trust the chef entirely. We were all delighted with the food and the service. On Sunday morning, it was only a short boat ride to the Liberty ship. 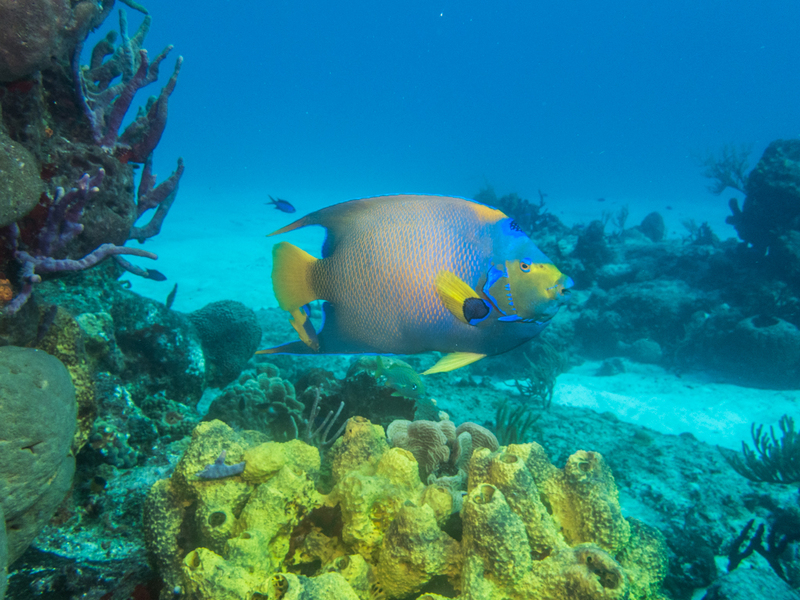 The visibility about 40 feet under was quite limited – about 10 feet – and the creatures we saw on our two dives were all small ones. We were hoping to find an octopus, which didn’t happen, though we did see some oyster toadfish and a striped burrfish. We were happy that we didn’t lose each other in the murky gloom, and that we managed to find our way back to the anchor line and the boat. Last week we went to see Mission Impossible: Rogue Nation, and liked it. This movie isn’t designed to provoke deep thought so much as to administer a dose of adrenaline, which it does admirably. There are various fine chases and explosions, amazing disguises, shoot outs, and, of course, some heroic computer hacking. It moves right along, and has an occasional wink as if to say, we all know this is a bit over the top. Tom Cruise is remarkable, in that somehow, despite all we know about his incredible Scientology goofiness, he brings us in and takes us right along. Rebecca Ferguson plays his female counterpart from the British secret service. She is perhaps the most accomplished hand-to-hand fighter we’ve seen on the Mission Impossible team, and she looks particularly wonderful in an evening gown. There was a moment or two when I thought, hasn’t this been done before? Yes, of course it has. With Jim Phelps, James Bond, Indiana Jones, and numerous comic book superheros. But who cares – it’s still fun. Though it’s worth noting that the meta conceit of this Mission Impossible is potentially thought-provoking. I’ll not spoil it by just saying: what if a spy agency of a major power got out of control? And the spies had awesomely powerful weapons and no accountability? And the spying became detached from any ordinary purposes or values, except for – spying. Of course, that could never happen. I had a major and positive transformation in my work place technology last week – I got a stand up desk. This model is sturdy, roomy enough for two monitors and a keyboard, manually adjustable between sitting and standing with ease. I’ve been concerned about the hazards of too much sitting for a while. There’s credible research that sitting more than three or four hours a day elevates various risks, from hunched shoulders, hip and back problems to cardiovascular disease and cancer. There’s info here, here, and here. My doctor agreed and recommended more standing. My initial impression is, standing is invigorating. I feel more energetic and focused. I lower the desk for intervals to do certain tasks, like taking notes on phone calls, and also to change things up, but spend a lot more time on my feet. 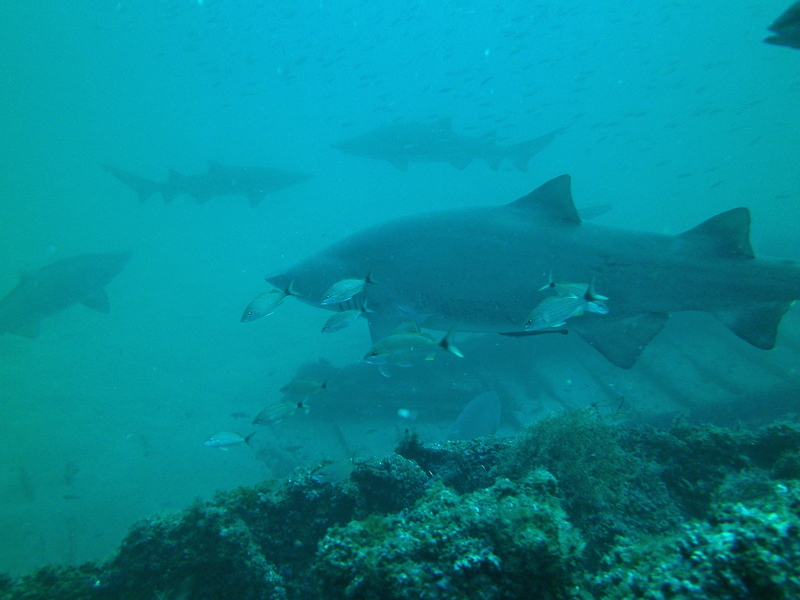 This weekend we went down to Wrightsville for a couple of wreck diving trips with Aquatic Safari. 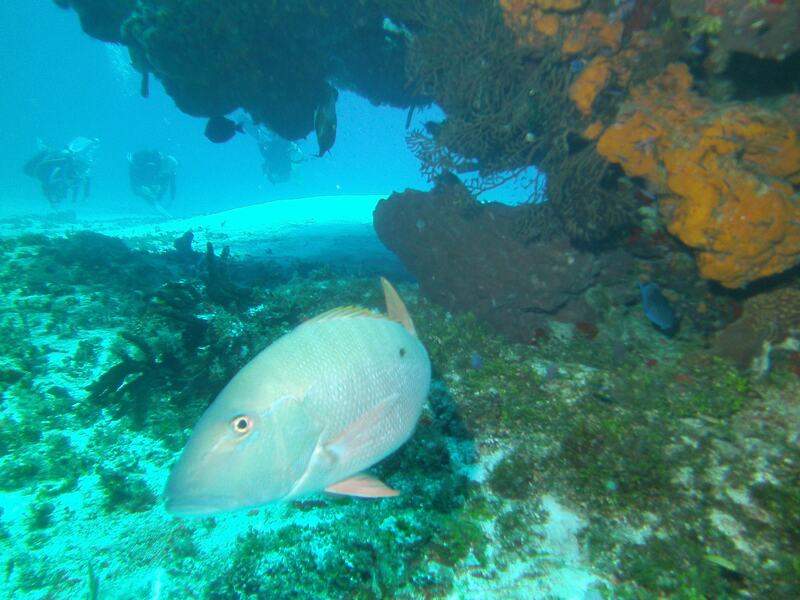 On Saturday, the seas were choppy, but we had a good dive on the wreck of the Pocahontas. There was reasonably good visibility, manageable current, and large numbers of small and medium fish. But I was reminded of Murphy’s law. My BC started leaking loudly as I got ready to go in, and the captain advised unhooking the low pressure inflator and regulating by oral inflation under water. I said okay and went down. But blowing up a canvas balloon while 60 feet under isn’t so easy. And I had problems with my camera. The boat was pitching dramatically when it as time to get back in, and the metal ladder came down on my head, with blood resulting. Nurse Sally examined it and commented that it didn’t look like it needed stitches. 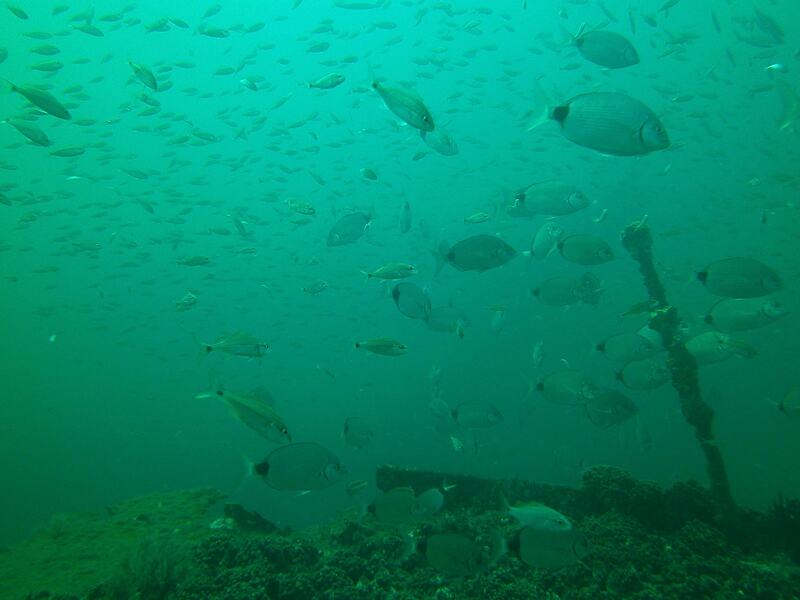 On Sunday we did two dives on the wreck of the Liberty ship. This required only a 15 minute boat ride, and the seas were calm. Visibility was not great – perhaps twenty feet at most, but we saw two octopuses (a rare treat). 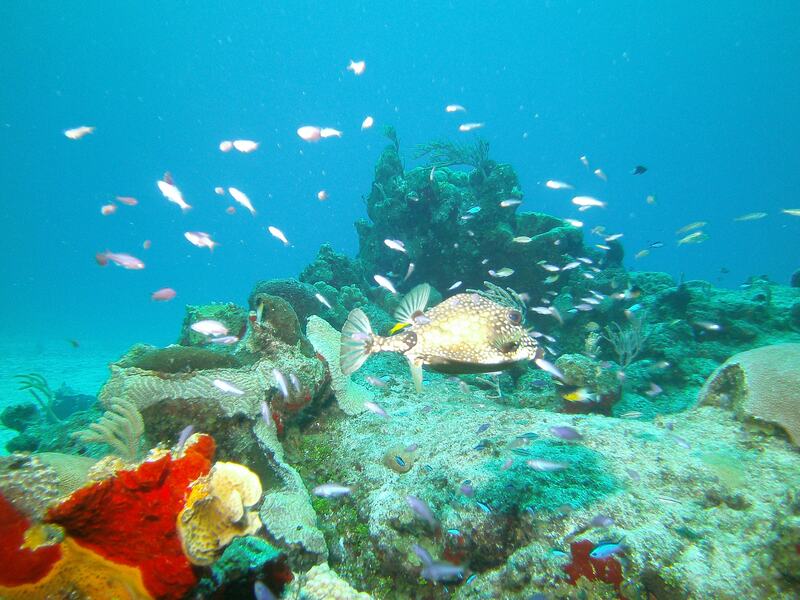 Also notable were oyster toadfish, porcupine fish, jellyfish, barracuda, and one southern sting ray. Lately I’ve been consciously trying to cultivate an attitude of increasing gratitude. As is traditional at the Thanksgiving holiday, I’ll note that I have a great many things to be grateful for. For me, gratitude also means noting connections and acknowledging how very little is attributable to my independent efforts. I really owe it all to everybody and everything else. And so, to you, dear reader, and everything else, I’m grateful. On Thanksgiving morning, I was grateful to be, at 59, sufficiently healthy to undertake the Ridge Road Turkey Trot, an 8 kilometer (4.97 mile) race. I hadn’t tried a road race with thousands of other people for a great many years. Sally sweetly lent her moral support and driving skills, and got me to the starting line five minutes before the 8:00 a.m. start. My idea was to challenge myself without collapsing or getting sick, and that much I accomplished. I completed the course in 44 minutes, or just under 9 minutes a mile. I wasn’t particularly proud about this time, since I still imagine myself as capable of 8 minute miles, but this T-day that wasn’t happening. My heart rate was in the low-to-mid 160s for much of the race, which is pretty high, and I didn’t want to find out what would happen if it stayed higher. The hills in the middle of the course took a lot out of me, and the last couple of miles were fairly miserable. Part of me badly wanted to try a bit of walking instead of running. But I didn’t quit, and I did survive. After the race, I took a long hot shower, and then sat down and read for a while. I finished E.O. Wilson’s The Meaning of Human Existence. Wilson, a world-renowned exert on ants and a leading theorist on evolution, is now 85, and going strong. I enjoyed reading The Social Conquest of Earth, and liked this book as well, in spite of its grandiose title. Wilson puts things in perspective, and helps us grasp that humans are just one of the millions of species on the planet. His basic message is that we can improve our chances of survival and happiness by using the tools of science and better understanding our evolutionary nature. Wilson contends that natural selection proceeded along two paths, individual and group. He argues that this accounts for our dual nature as selfish individuals and altruistic group members. These conflicting tendencies are fundamental drivers of the human experience, which means we’ll always be in some degree of tumult in our interior emotional lives. But Wilson thinks our contradictions are essential to what it means to be human, and we need to understand them and manage them. He seems to think there’s a chance that humanity can overcome ignorance, delusion, and violence, and quit destroying the natural world. 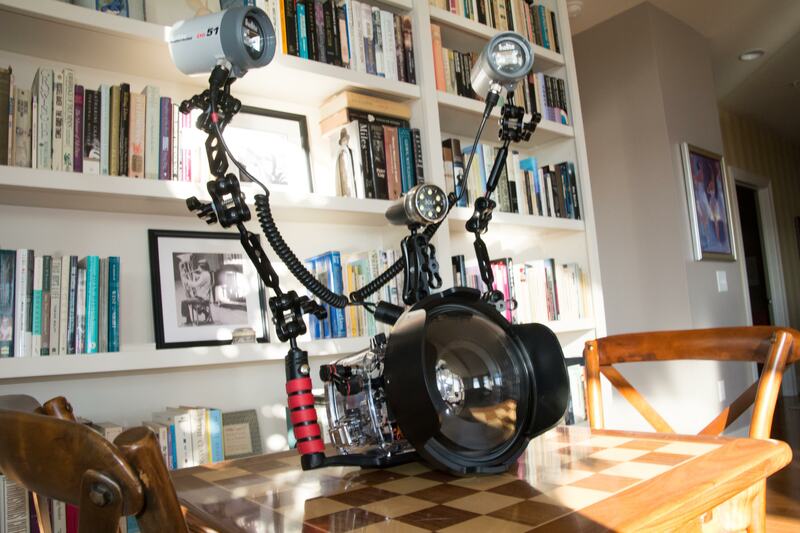 I spent part of the afternoon assembling and testing my new Ikelite underwater camera housing and strobe setup. I thought long and hard before buying the equipment, both because it is pricey and because it is labor intensive. But I’m really interested in sharing some of the joy of diving through images of the extreme beauty beneath the surface. Even in this time of over fishing, ocean acidification and reef destruction, there’s still an incredible profusion of life down there. 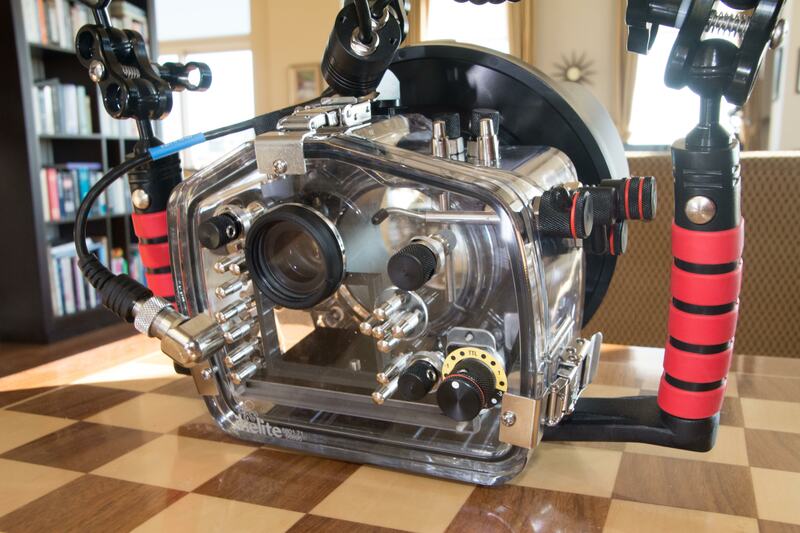 If you’re going to use an underwater housing with an expensive camera, the stakes are high. The Ikelite housing opens at the back to receive the camera and the front to receive the lens. You’ve got to be extremely careful to prevent leaks, which can easily be fatal to the equipment. And working the camera through many unlabeled buttons and levers is challenging. Just figuring out how to put it all together took me several hours. 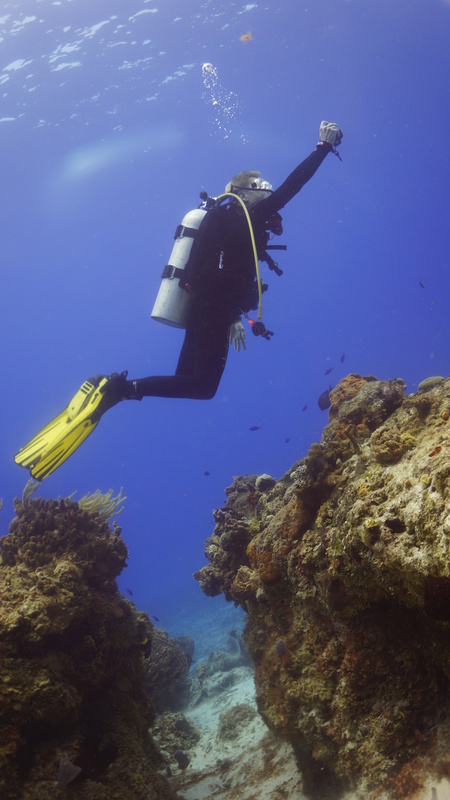 And hauling the it safely to dive spots while staying within airline weight restrictions will be challenging. But I’m looking forward to new dive photo adventures. We had our Thanksgiving dinner at Irregardless, Raleigh’s first vegetarian restaurant, which now also accommodates meat eaters. Gabe and Jocelyn decided to wait until Christmas for a visit, so Sally and I ate with her mom and sister, Diane and Annie. We also were joined by Alyssa Pilger, the Carolina Ballet dancer we’ve been sponsoring, who is enormously talented. It was fun to hear about ballet company happenings, and about the professional dancer’s life. Professional dancers are almost by definition intensely focused people with superhuman work ethics, but Alyssa offstage seemed comfortable, relaxed and un-self-absorbed. Sally and I saw the movie Interstellar on Friday night at the Marbles Imax theatre. I didn’t think it was particularly well constructed or acted. I found it cheering, though, that the movie has found a mass audience. The basic set up is a post-climate apocalypse world, which is something we should be trying hard to visualize and then prevent. It would be nice if a good-looking astronaut and his attractive physicist daughter could save us all, but that seems extremely unlikely. We’ve got to figure out how to repair our dysfunctional political structures so that we can get organized and address global warming and related problems with the intense commitment and resources we once used to go to the Moon. 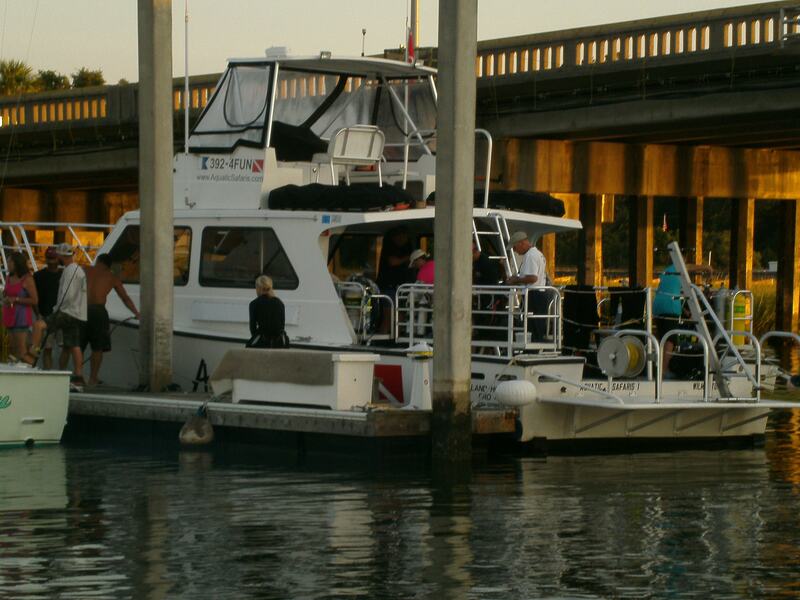 We had a dive trip this weekend out of Wrightsville Beach with Aquatic Safaris. We were scheduled to go to two wrecks on Saturday afternoon, the Hyde and Markham, but rough seas prevented that. Plan B was the Liberty Ship, which sits just three miles offshore. Things were bumpy with some current, and I found my heart rate and breathing increasing as I went down the anchor line. There were still a few leftover thoughts of my near death experience of a few weeks back. Visibility was quite bad – perhaps 5-10 feet. We followed a line laid out by the mate. There wasn’t much we could see besides the line. It was nice to be diving again, but this was not pleasant diving. The second dive was similar. There were several divers taking a wreck diving course who laid out lines, and we got their lines confused with the mate’s line at one point. We finally figured it out and made it back to the anchor line and the boat. Saturday night we stayed in Wilmington with Sally’s sister, Anne, and went to Cichetti, an Italian restaurant. We had a nice meal and a lively conversation. We discussed Shakespeare’s concept of evil, Greek playwrights, and youthful experimenting with psychedelics and pot. We also talked some about slavery, which I’ve been reading about in a new history of the pre-civil war and civil war period called Ecstatic Nation by Brenda Wineappple. The book brings vivid life to the 1850s when there were slave states and free states, and it was by no means clear which would ultimately prevail. It require real imagination to understand the pro-slavery viewpoint. Wineapple is certainly not pro-slavery, but she gives a sense of the incredible intensity and complexity of the struggle. Early Sunday morning the skies were clear and calm, and the seas were calm as well. We left the marina about 7:30 a.m. and made it to the wreck of the John D. Gill in about an hour and half. The Gill was a tanker sunk by a German u-boat in WWII. Visibility was pretty good – perhap 50 feet. 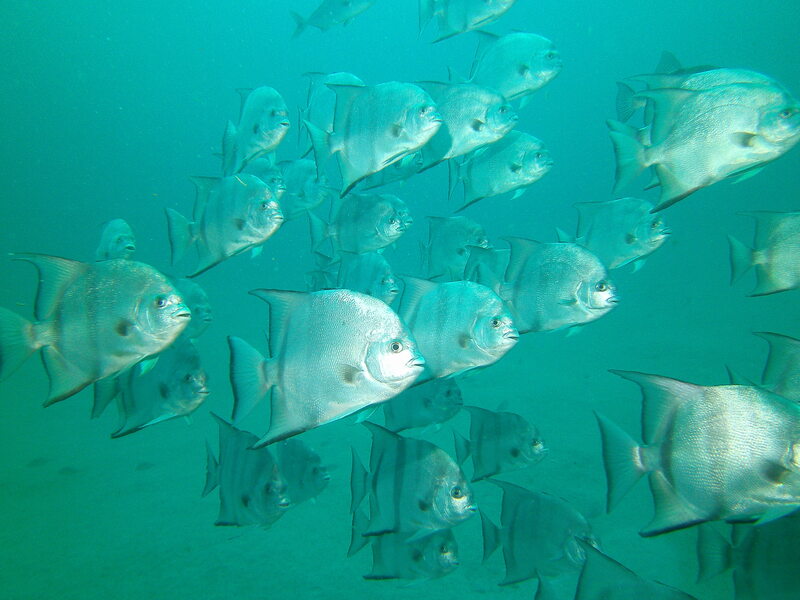 We saw several barracuda and thousands of small silvery fish, and we also spotted two large flounder. For the last dive, we went to the Hyde, a wreck that still look like a ship, though with lots of things growing on it and lots of fish around it. 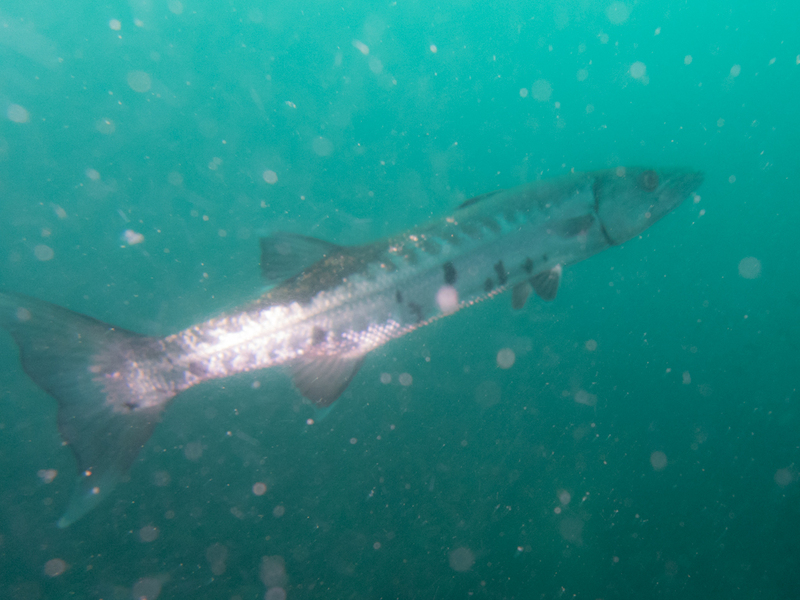 Visibility was less good – maybe 30-40 feet – but the wreck itself was interesting, and we could see thousands of little fish, along with many barracuda. 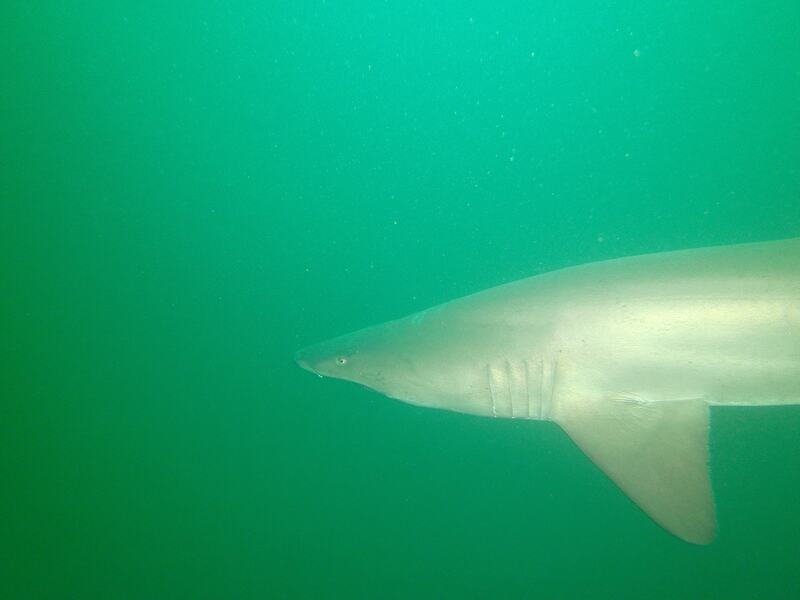 One sand tiger shark passed close by. 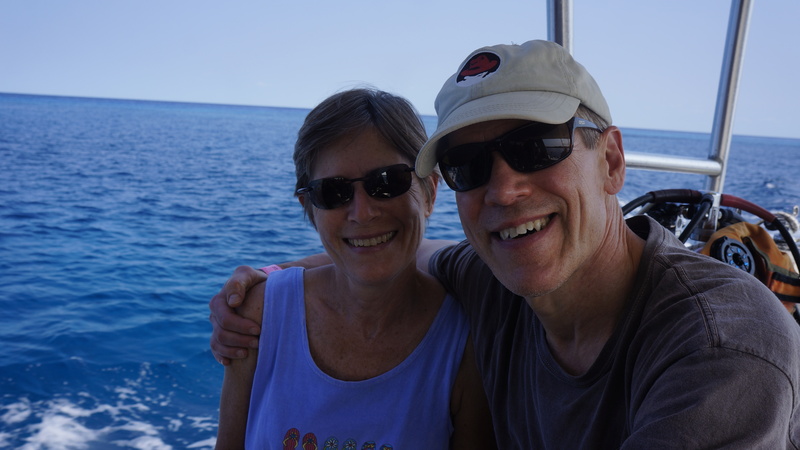 Sally and I just got back from a week of scuba diving in Cozumel, Mexico. As a friend recently noted, we like adventure vacations. If you do, too, you would probably like Cozumel. The diving was great, and the above-water scene was lively, too. Cozumel is a warm and enterprising place. 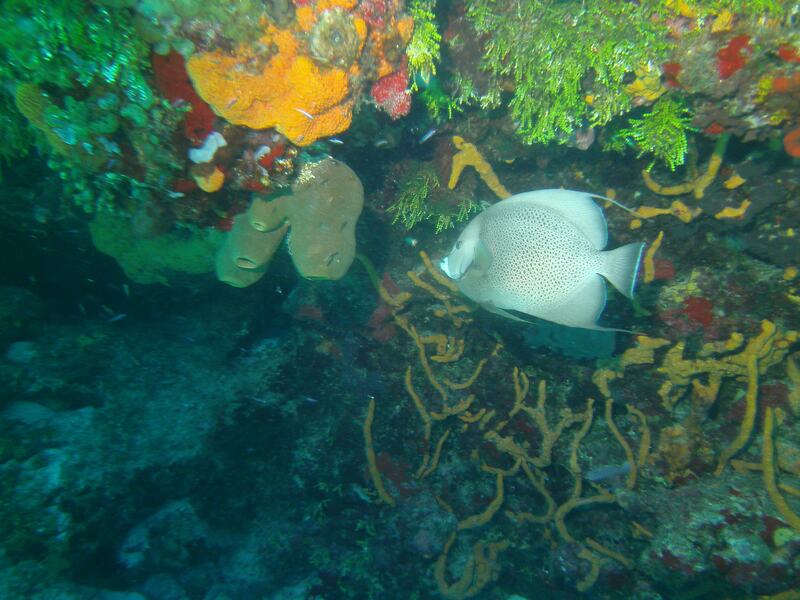 Most of the real beauty, for me, is in the reefs, but I also really liked the people. The Mexicans I met are mostly cheerful and good humored, but also polite and dignified. They worked hard to help us along our way. 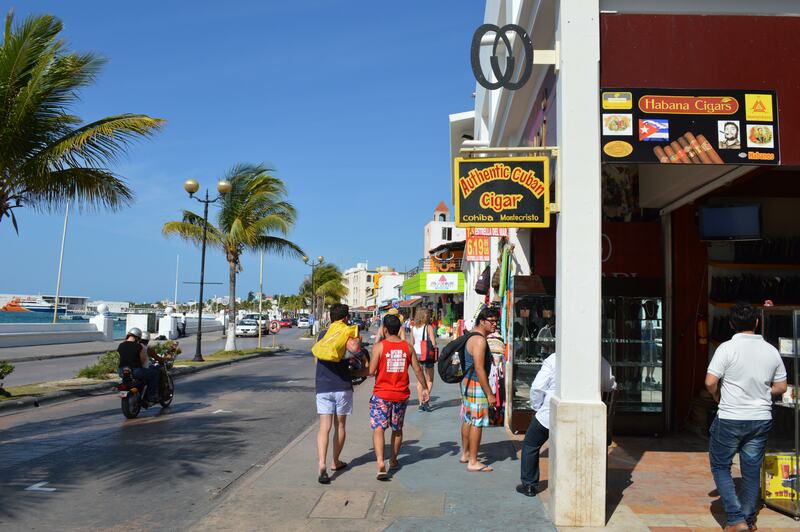 The business of Cozumel is tourism, and there are many layers to this business, from high end hotels to street hawkers. A stroll through the main part of town takes you past many gold and silver jewelry shops, clothing shops, crafts establishments, restaurants, and shops selling Cuban cigars. Most of these shops have a person who will try to persuade you to look inside, some of whom are aggressive and insistent. It’s a bit annoying if you’re not interested in the goods, but the beautiful blue water fronting the main street makes up for any inconvenience. I’d been planning to use more of my Spanish, which is still a work in progress, but had little occasion to. The sales and service people of Cozumel have highly developed antennae for spotting los norteamericanos, and encourage expenditures by using English, which ranged from adequate to impressive. A couple of waiters gently corrected my usage mistakes, which I appreciated, and I think they appreciated my making some effort with their language, but it was clearly not required. Our hotel was the Casa Mexicana, a mod-looking place on the water in the center of town. Our rooms was attractive and comfortable, with a balcony overlooking the courtyard restaurant where we ate very satisfying breakfasts. The lobby was on the second floor with a pool and deck chairs overlooking the water. Lots of restaurants were within walking distance, though we took a taxi to our favorite, Casa Mission. The hotel was only a few steps from the shop of the folks who took us diving, Aqua Safari, and the boat dock was just across the street. 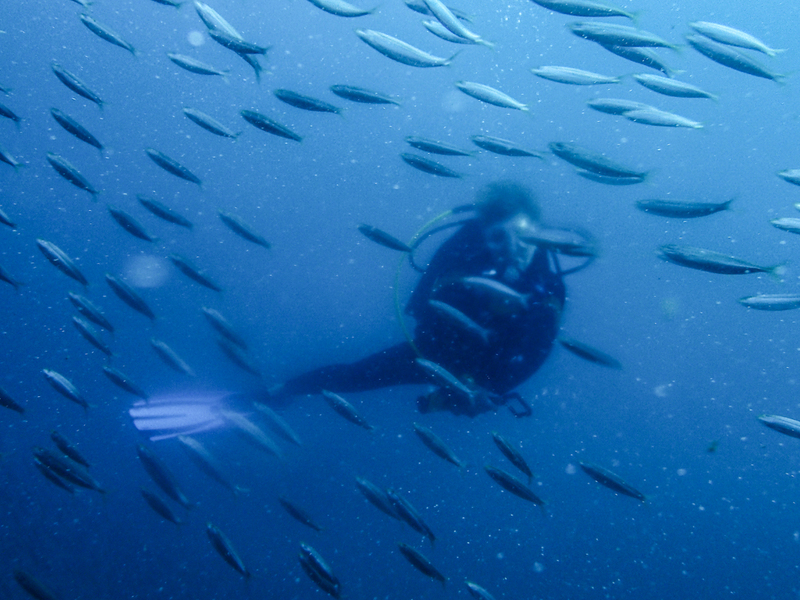 Our boats usually had about fifteen divers. These included our group of six organized by our friend Dan out of Down Under Surf and Scuba. 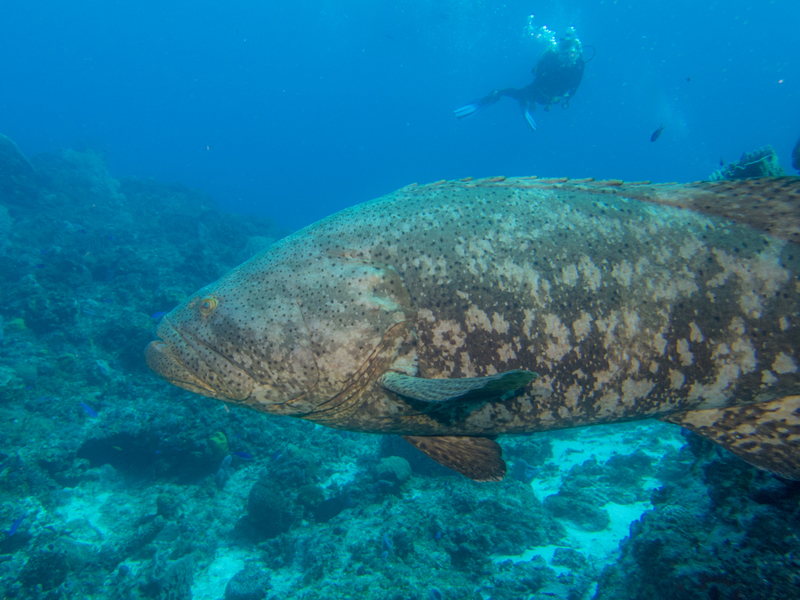 We did two dives in the morning, and after returning to the dock, we either ate quickly and went out for an afternoon dive, or on two days relaxed and then went out again at 7:00 for a night dive. 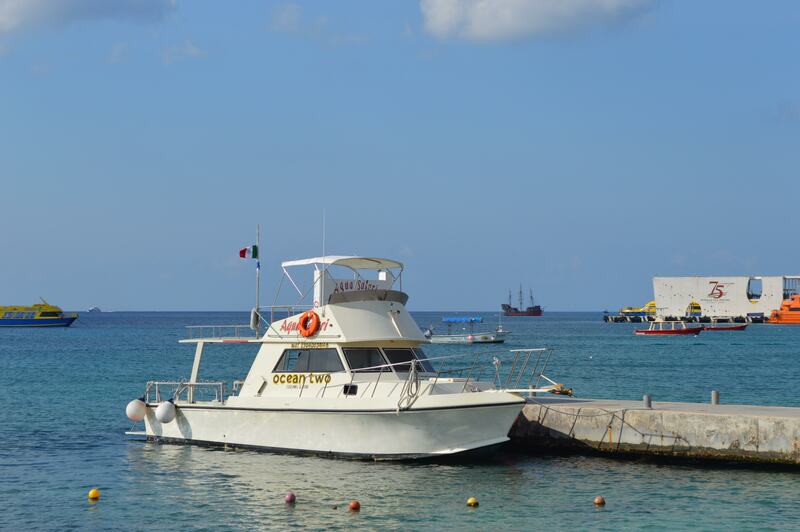 The boat rides to the dive sites were generally one to 1.5 hours. 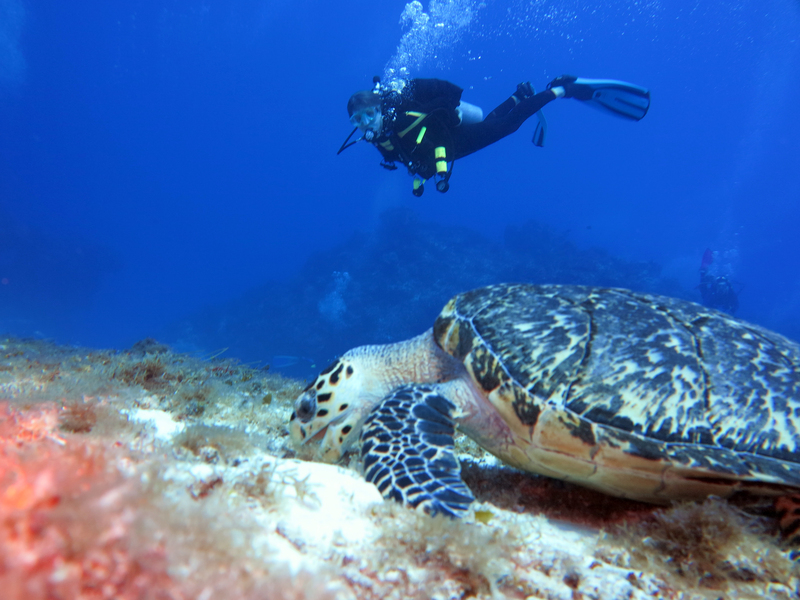 Our guides were experienced, and showed us many interesting places and creatures. Early May seemed a good time to be there – sunny, breezy, and not un-Godly hot. 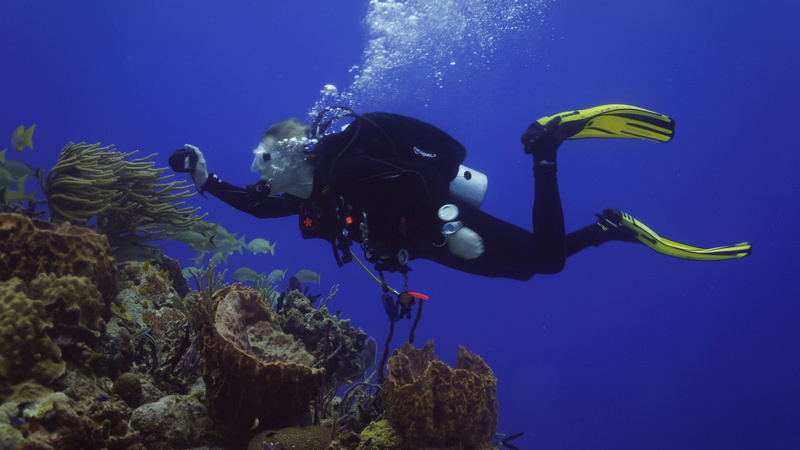 Our dive environments fell into three main groups: coral walls that went much deeper than we could dive, coral patches separated by sandy areas, and large coral structures shaped like pillars, boulders, mesas, and canyons, which made me think of southwest Utah. There were dozens of species of live coral. 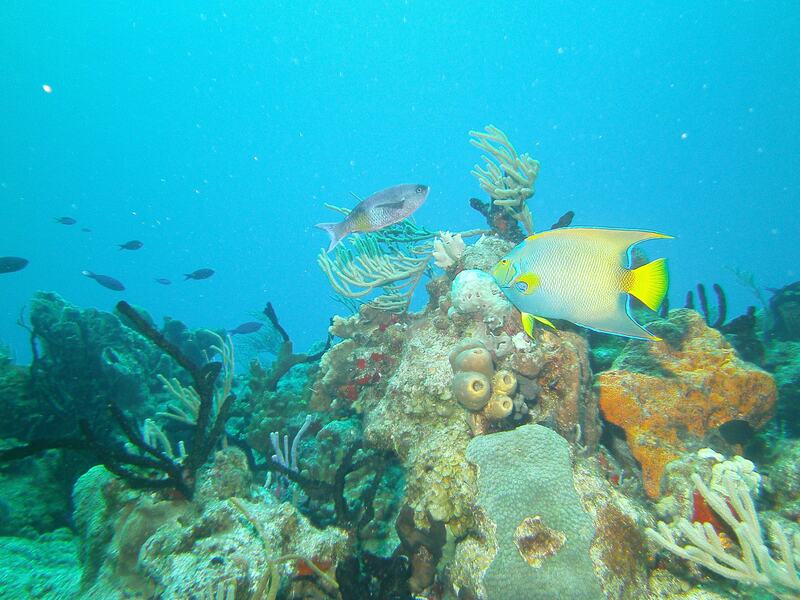 Some were vivid colors (purple, orange, green, yellow, red), and we also saw the famous black coral. Their shapes and textures were fantastically varied, including ones that looked like cactuses, pillars, antlers, brains, and various vegetables. 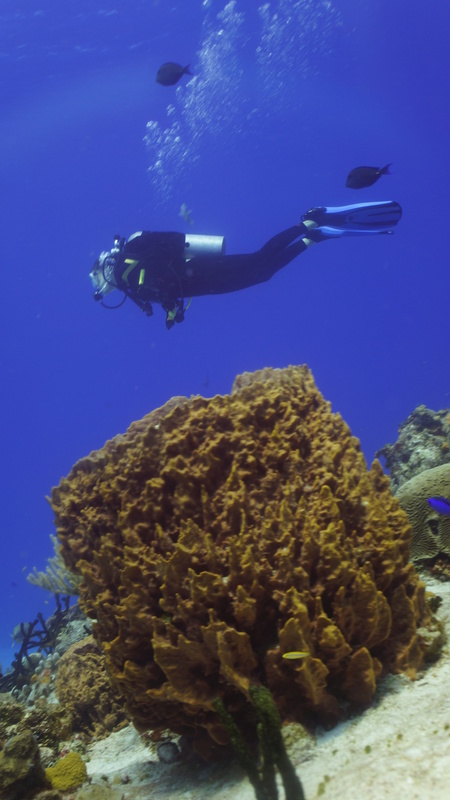 Cozumel is famous for drift diving, meaning a trip that goes where the strong current takes you. This can be exhilarating, but is also challenging at times. In the strongest current, there is no easy way to stop or reverse course, and it can feel by moments like Lost in Space. 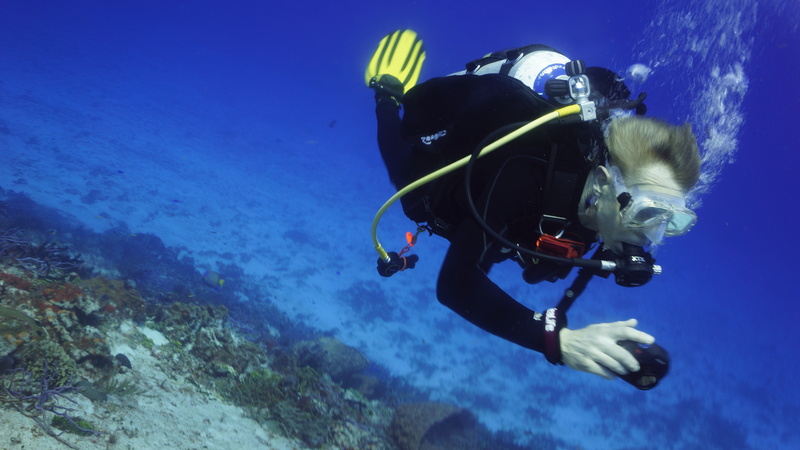 This requires alertness to avoid collisions with people or coral, and limits the chances to take photographs or look at things with deliberation. There were dive sites with little current, though, which were calm and sweet. 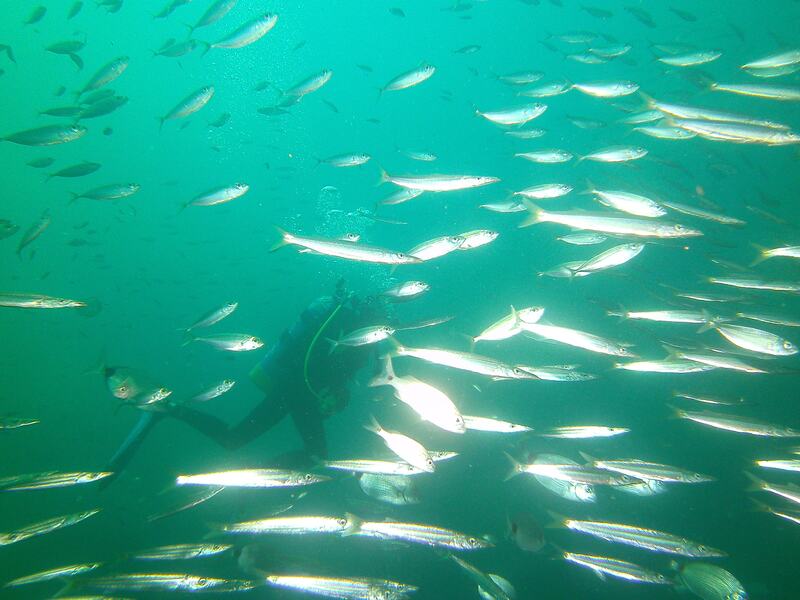 And of course, there were thousands of fish and other creatures. 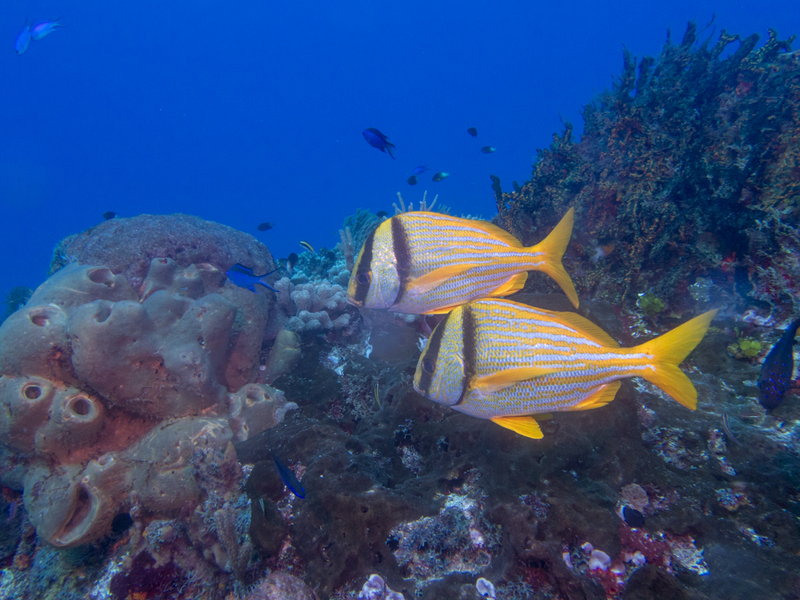 We’ve been trying to improve our identification skills, with the useful reference works on reef fish, creatures, and coral by Paul Humann and Ned Deloach. 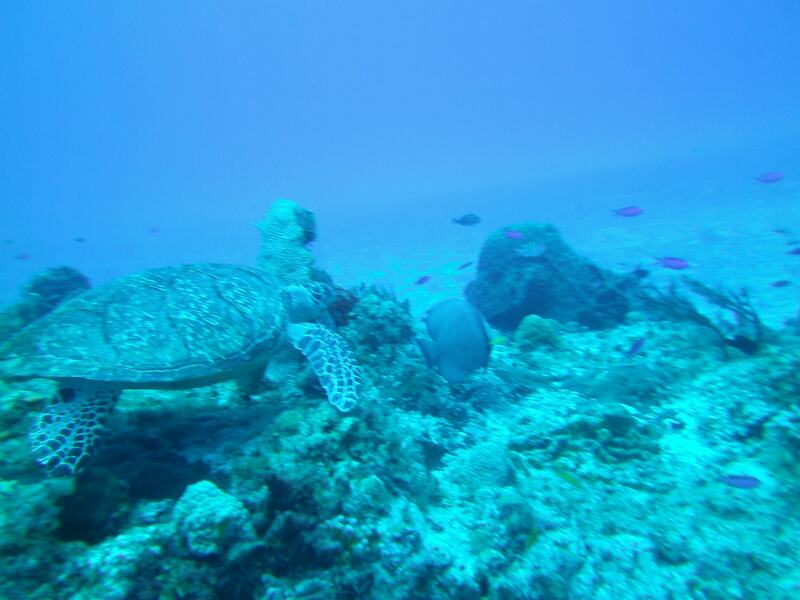 Sally was prepared to ID a green sea turtle, of which we saw only one, though we saw several hawksbills. She also introduced me to the whitenosed pipefish and various seahorses. 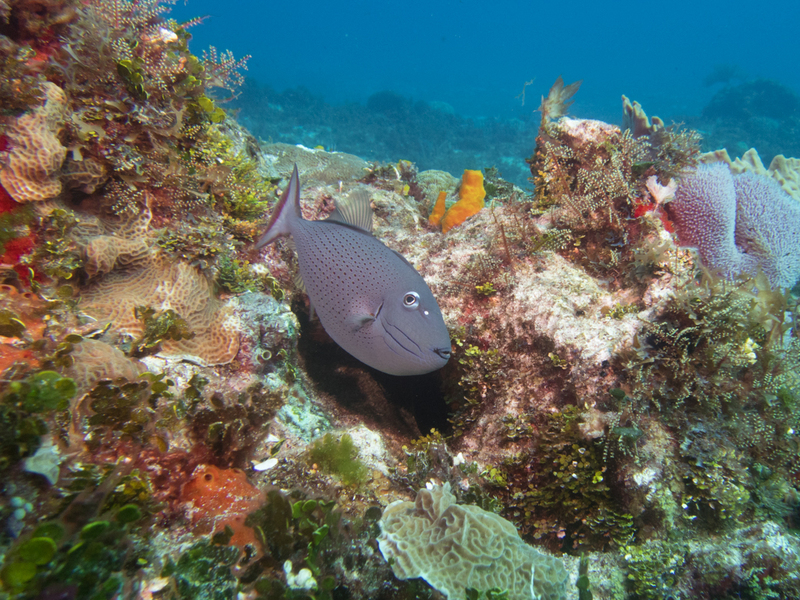 There was no shortage of bizarre looking creatures, including the porcupine fish, splendid toadfish, flying gurnard, smooth trunkfish, trumpetfish, honeycomb cowish, scrawled firefish, and queen triggerfish. 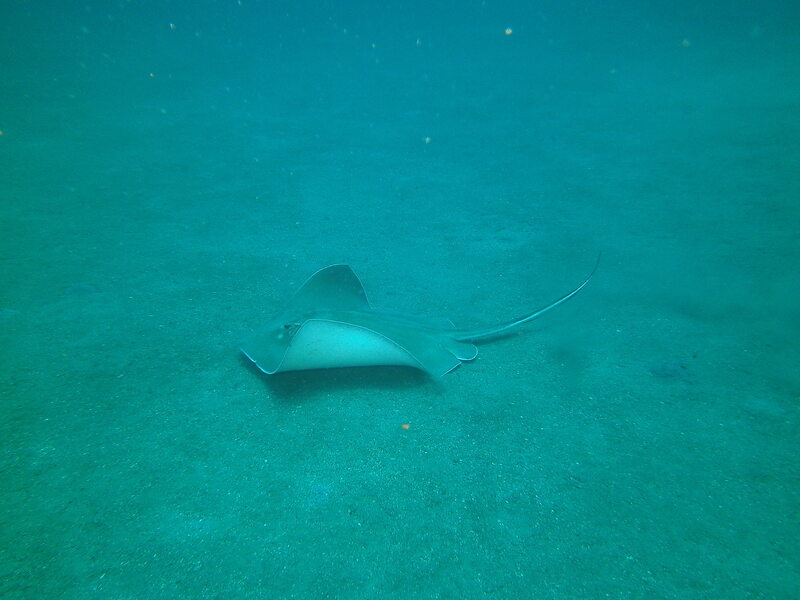 We saw southern stingrays, as well as yellow rays and a Caribbean torpedo ray, and spotted and green moray eels. 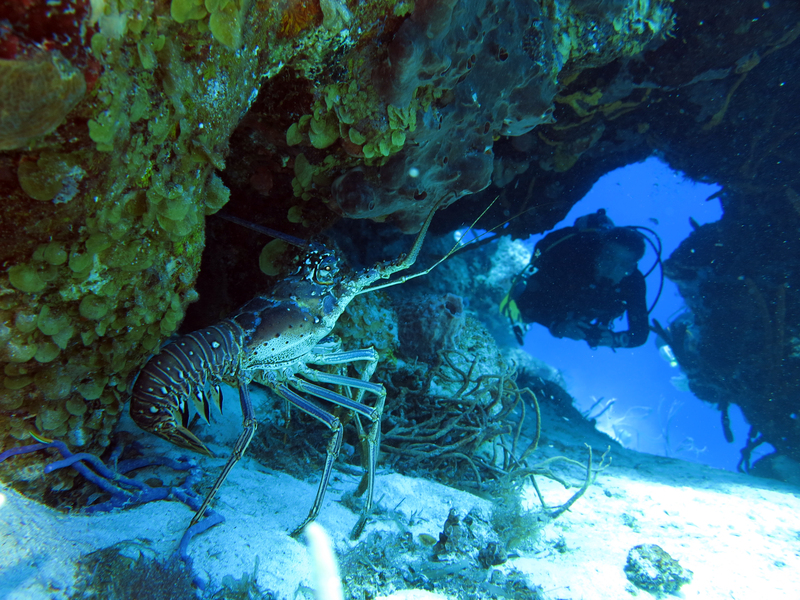 There were also large spiny lobsters and crabs. On a night dive I saw two octopuses that transformed themselves into objects of varying shapes and colors. It was fantastic! 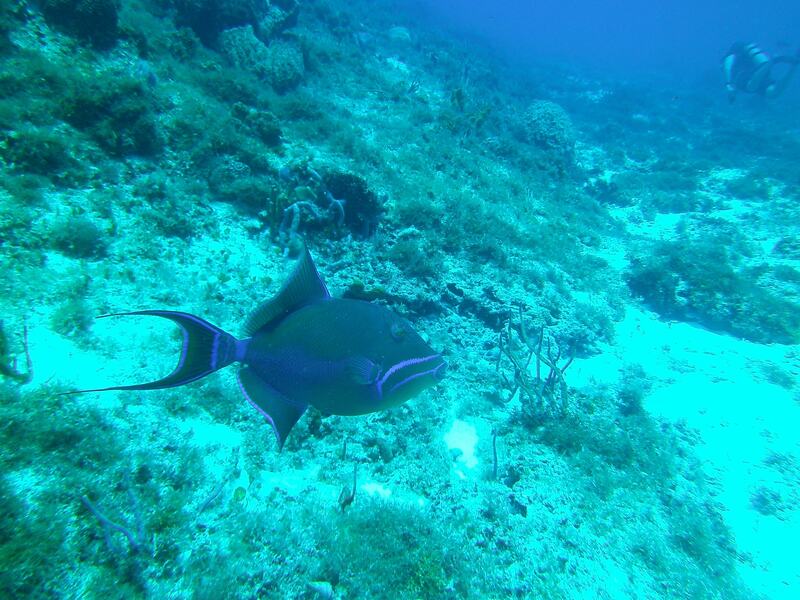 One species we we pleased not to see many of was the lion fish. 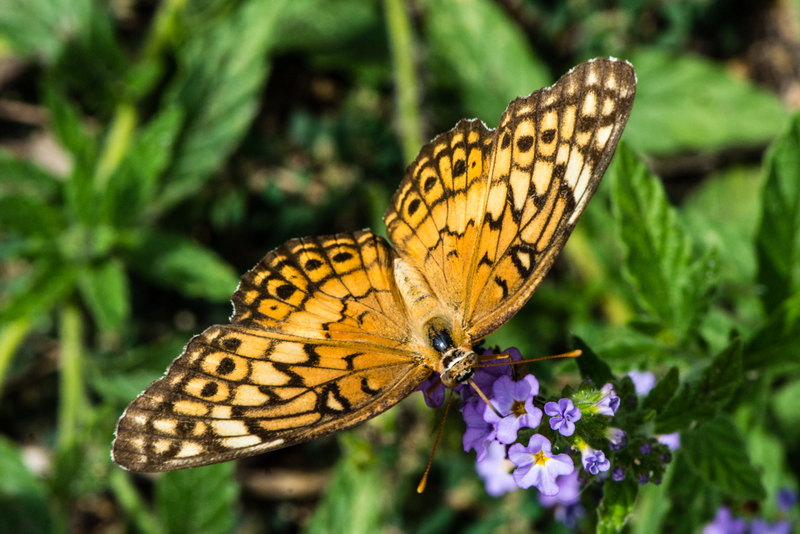 These invasive predators reproduce quickly, have no resident enemies, and consume voraciously. 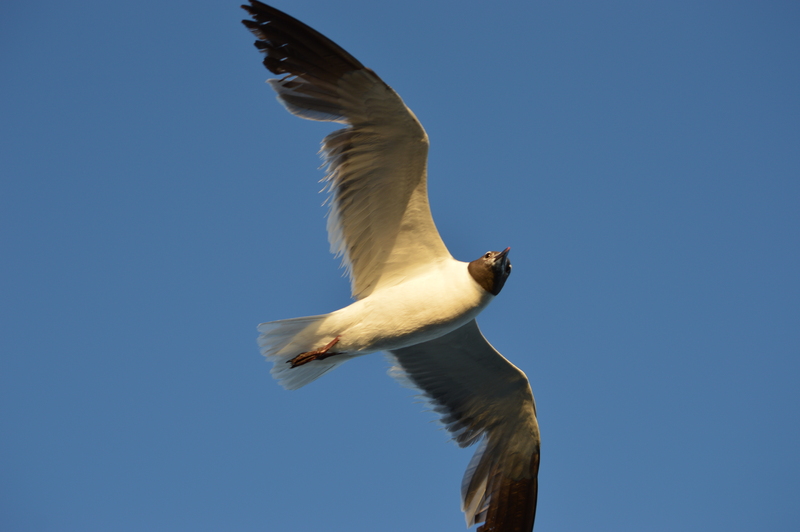 They’re now common in the northern Caribbean. 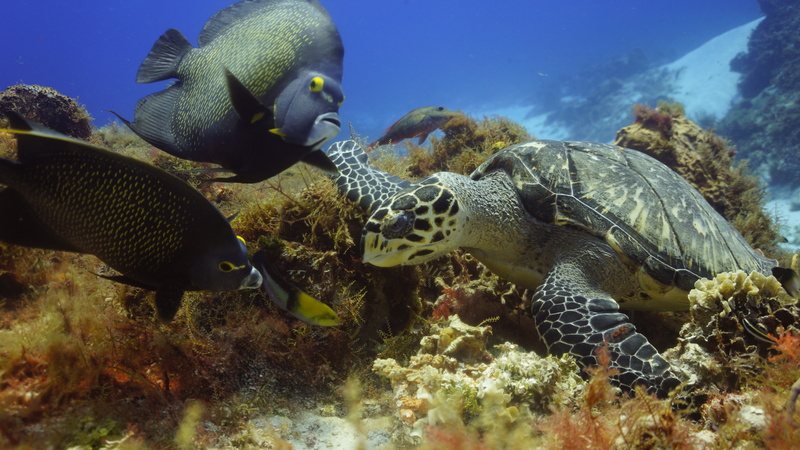 Our main guide, Miguel, said that the dive guides in Cozumel had been authorized to kill them, and the numbers have been substantially reduced in the most dived areas of the south coast over the lat three years. 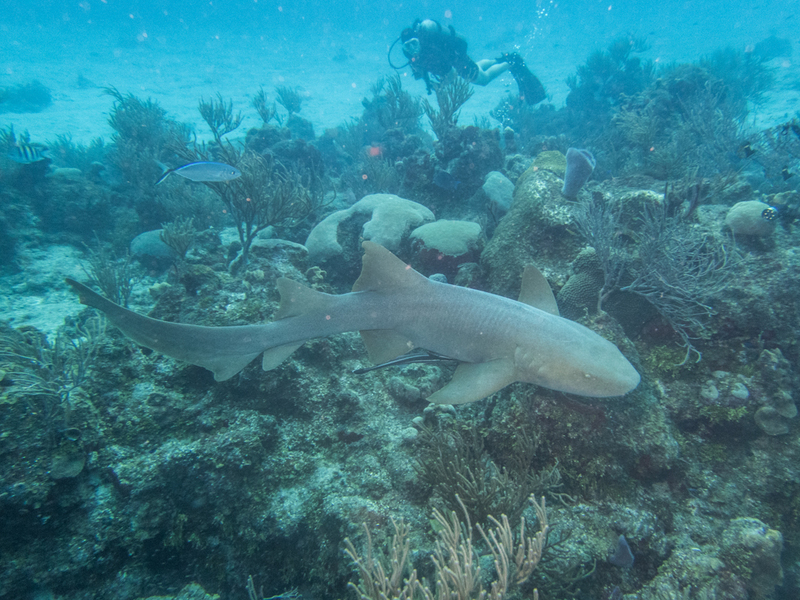 We also saw some big and medium creatures: nurse sharks, black groupers, barracuda, giant parrotfish, jacks, grunts, and snappers. 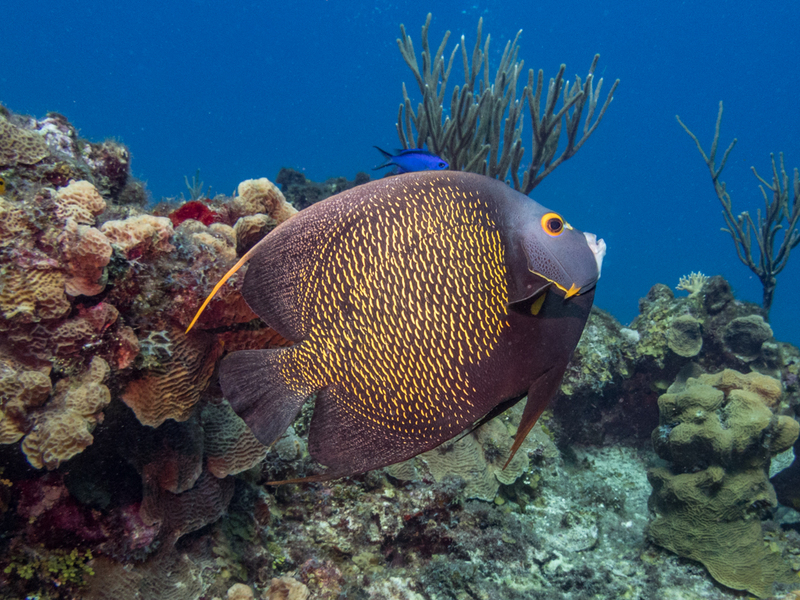 I particularly adore the queen angelfish, and saw many, as well as French and gray angelfish. 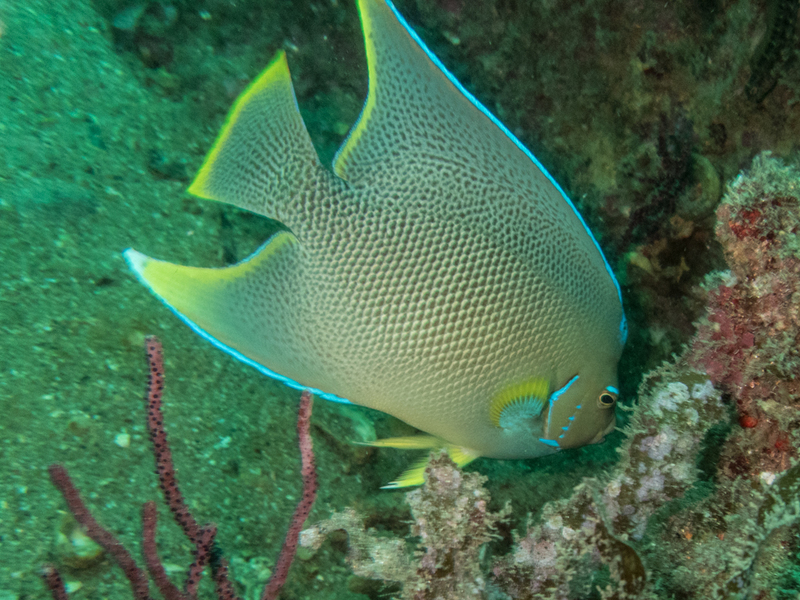 And there were untold numbers of colorful smaller tropicals – durgons, tangs, grunts, surgeon fish, butterflyfish, chromis, wrasse, and many others. 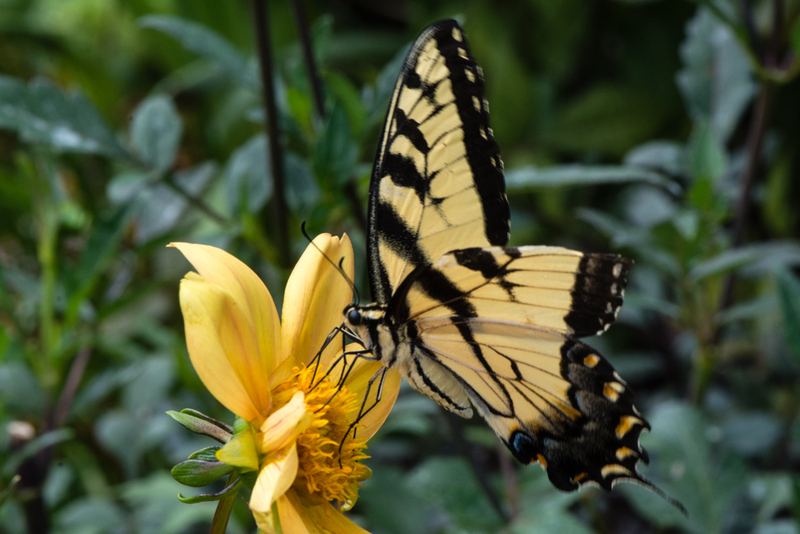 The profusion of life is amazing, still! The morning before our flight home, we rented a jet ski and sported about for a half hour. The machine, a Yamaha, seemed very powerful. The water was choppy, and I never quite managed to take the machine to full throttle, as it jumped and bucked. Sally rode behind me, and proclaimed herself thoroughly shaken and glad to still be alive when we were done. But note, she never complained or requested that we slow down. That’s my gal! 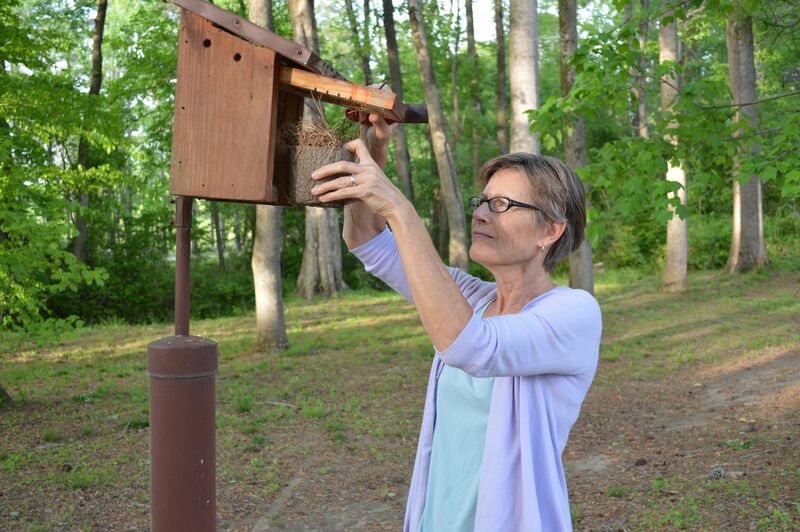 Since 2004, Sally has tended a group of bluebird houses in Cary on the Lochmere golf course, near where we used to live. 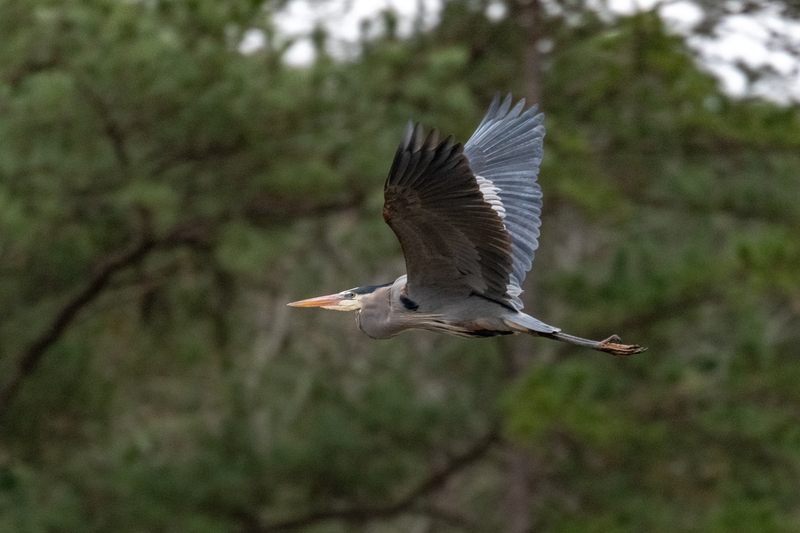 She keeps fourteen houses in good working order and keeps track of the numbers of eggs and numbers of hatchlings, then passes the data along to the North Carolina Bluebird Society. Bluebird rely on human-built boxes for breeding spaces, and Sally likes helping them. 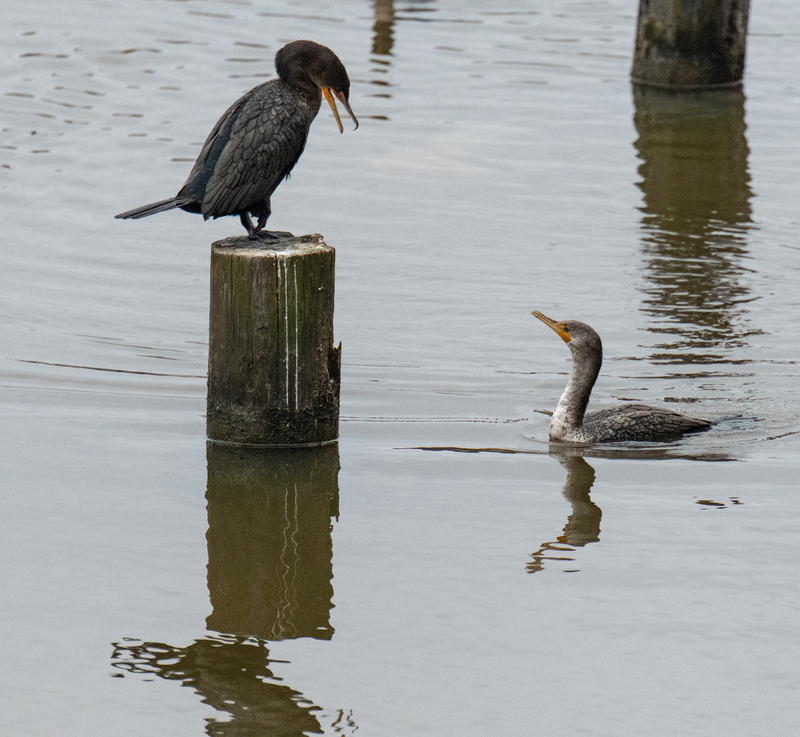 It’s the breeding season, and this week she invited me to come along after work to see the activity. She already had secured a golf cart when I arrived. It was a sunny, mild afternoon, and there were plenty of golfers out on the course. 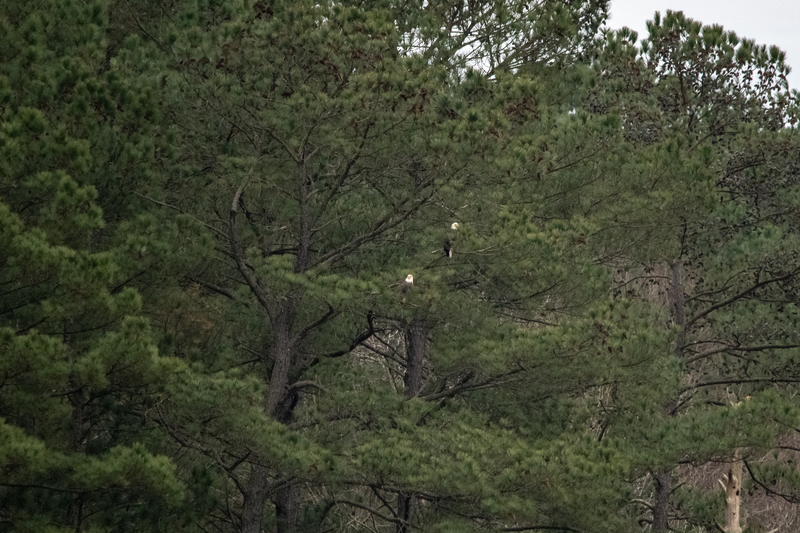 She started with hole number 1, where Sally opened the door, pulled out the nest of pine straw, and found several dark gray nestlings, which snuggled together quietly. 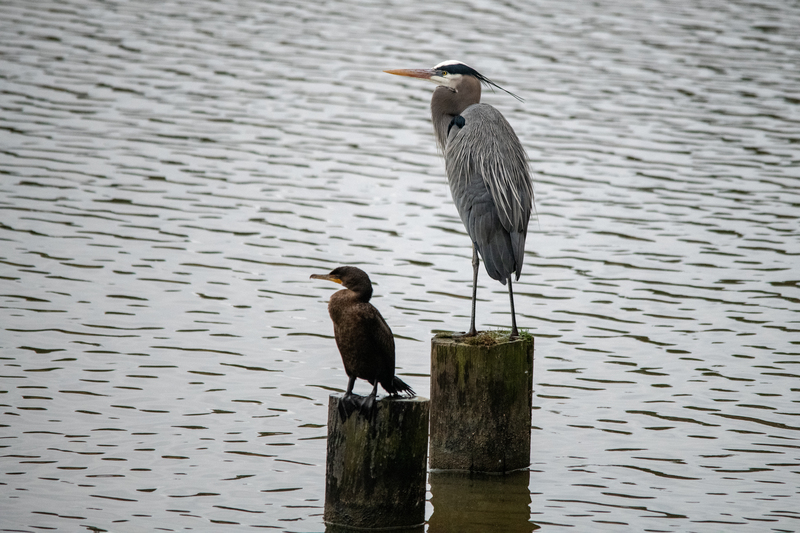 Their mama was not at home, but at the next house, the mama bird shot out as we got close to the house and nearly hit my face. 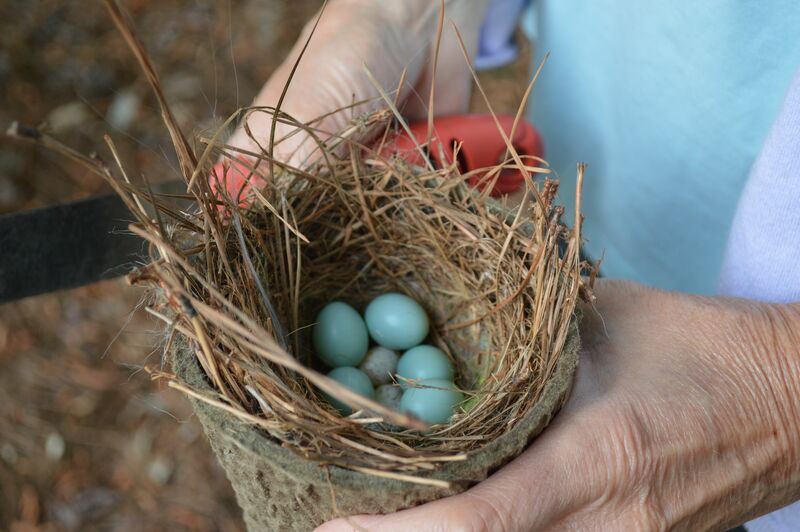 At the third house there were both bluebird and chickadee eggs. We saw several others populated by hatchlings and eggs that must have been close to hatching. In one, where there had been eggs the week before, there were none. Sally said a snake had probably got them. It seemed sad, though not, I guess, for the snake. 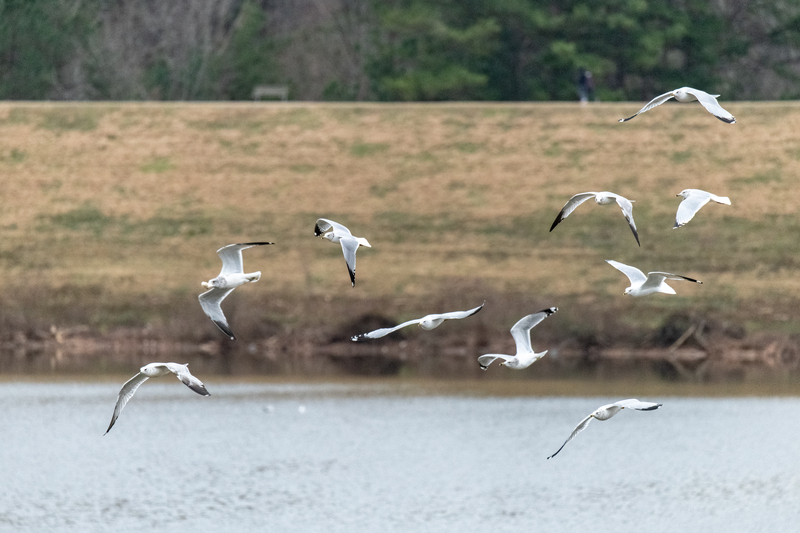 Anyhow it was most pleasant to see the birds and birds-to-be with my dear one, and learn more about their lives. We have tickets for a trip to Cozumel next week for several days of scuba diving, and this week we met with our group at Down Under Surf and Scuba to get briefed on drift diving and other procedures. Back home, we began our preparations — checking over the gear, refreshing on protocols, and paging through our sea creature identification books. 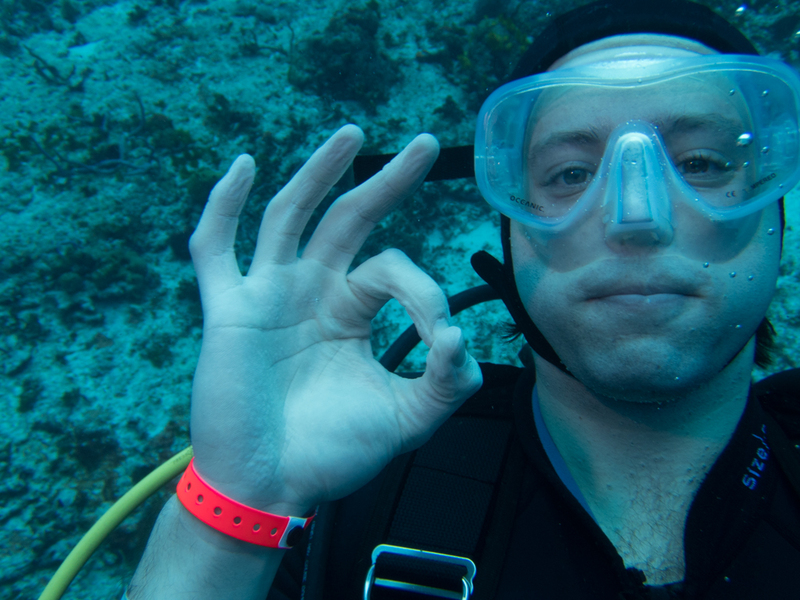 My underwater strobe wasn’t working properly, so I’ll need to get that over to the dive shop for a consult. Cozumel is English-language friendly, but even so I’ve been inspired to try to advance my Spanish. In addition to Rosetta Stone, I’ve been working on verb conjugation at a very helpful web site that generates drills for every tense. I’ve been focusing on the preterite and the imperfect, and improving. I’ve also been sampling lessons at Livemocha. This service invites native speakers of one language, like Spanish, to help those interested in learning their language, like me, and they may also get help in another language, like English, from someone like me. I’ve gotten useful written feedback from folks in Columbia and Mexico, and have tried to give others some helpful tips on English. The idea of the internet connecting language students is exciting. At the same time, it’s a little unsettling. Livemocha allows for “friending” requests, and I’ve gotten a few of these, but so far I haven’t accepted. I’m not quite clear on what the responsibilities, and risks, might be. I’m more or less constantly overcommitted already, and I would be sorry to disappoint my as yet unknown “friends” in, say, Columbia. And I would be particularly sorry if they turned out to be violent sociopaths of some sort. Speaking of internet risks, I had an odd experience this week. I finished The Self Illusion: How the Social Brain Creates Identity, by Bruce Hood, which I’d purchased from Amazon in the Kindle edition to read on my tablet device. The next day, I got an email from Amazon asking me how I liked The Self Illusion. !!! I hadn’t realized that Amazon had invited itself quite so intimately into my reading life. Of course, I didn’t read whatever they required me to click on (does anybody? ), so it’s possible that I in some hyper legal sense agreed to let them monitor my reading. But really! That’s just icky! 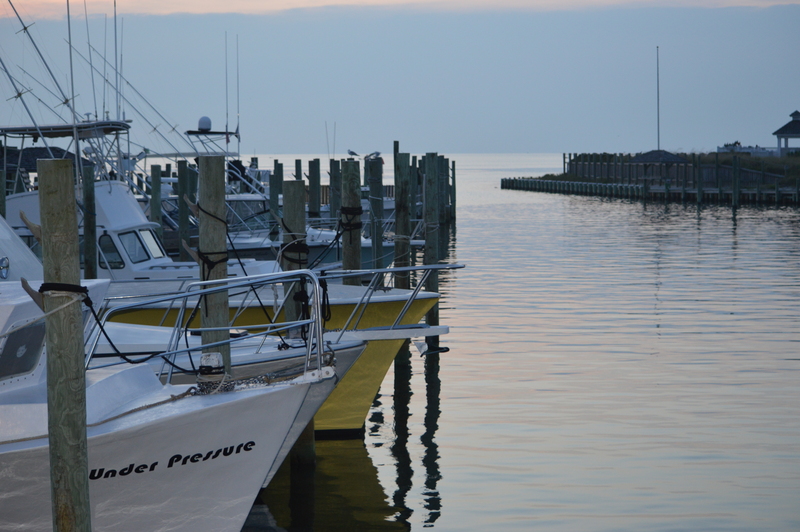 Sally and I did a diving trip out of Cape Hatteras last Thursday-Sunday. Although we live in North Carolina and love diving, these were our first NC dives. We’d assumed that the sea life in the vicinity would be sparse and the visibility poor, and that we’d find it a bit of a comedown after our Caribbean trips. It turned out this was way off. 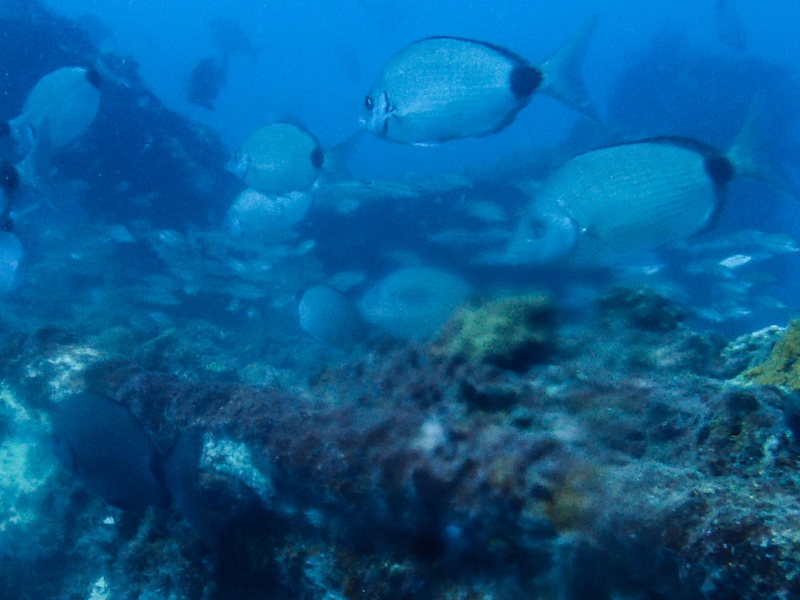 The NC ship wrecks we dove had a profusion of sea creatures and ample light. Thousands and thousands of little fish, and some very big ones. 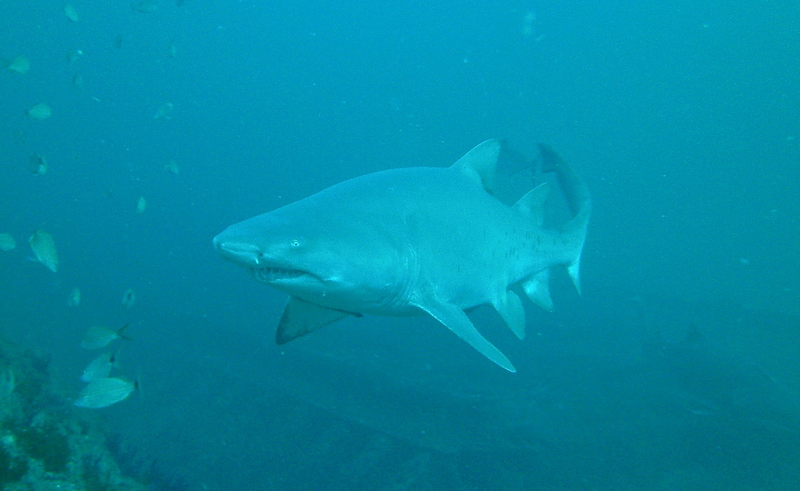 The most dramatic species we saw was the sand tiger shark. 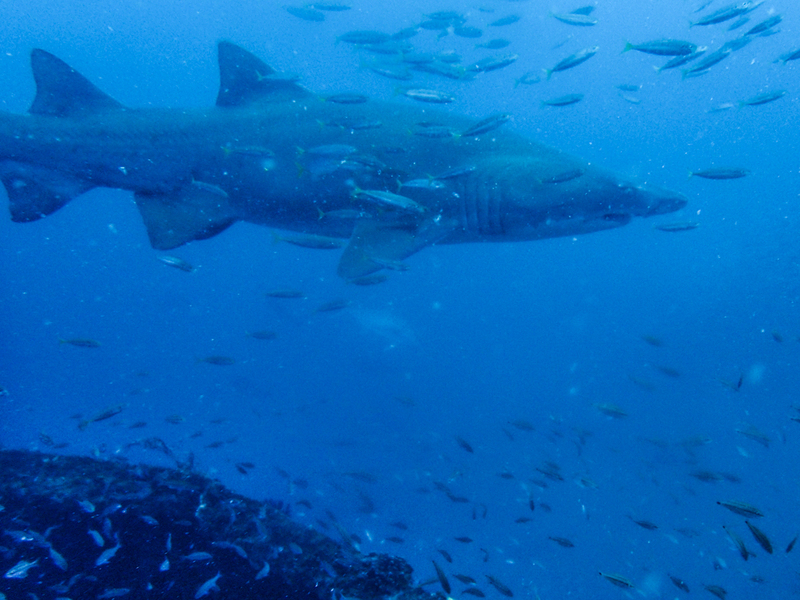 These shark are large (around 10 feet) and look mean. Apparently they are often used as the stock image for news stories about shark attacks. 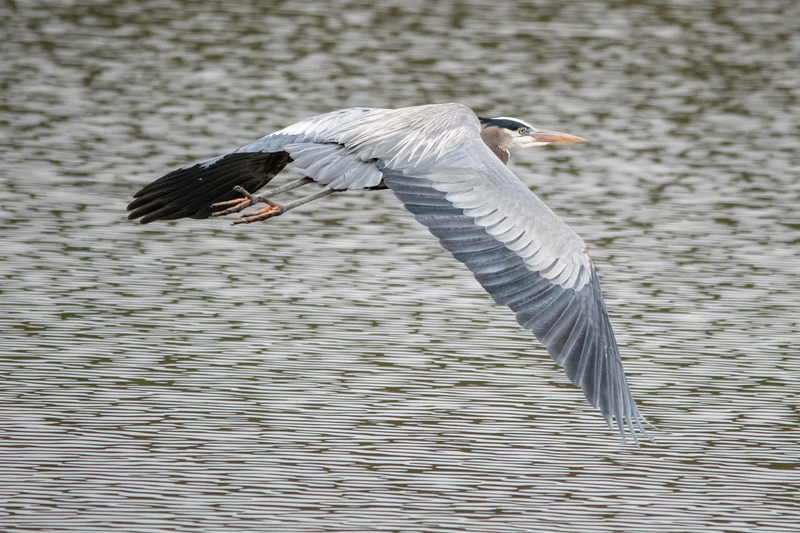 However, we saw dozens of them, and all were placid. They didn’t seem frightened of us, as was true of most of the species we saw, and we swam within a few feet of each other. 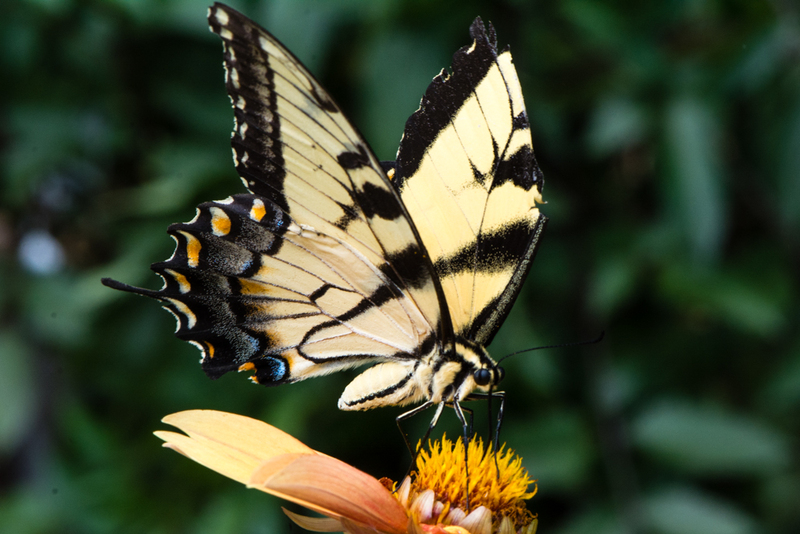 They are beautifully designed and graceful, and of course, imposing. I try to think of sharks in the way I think of bears — creatures that are potentially dangerous, but also fascinating parts of the natural world. They are not programmed killing machines or embodiments of evil. 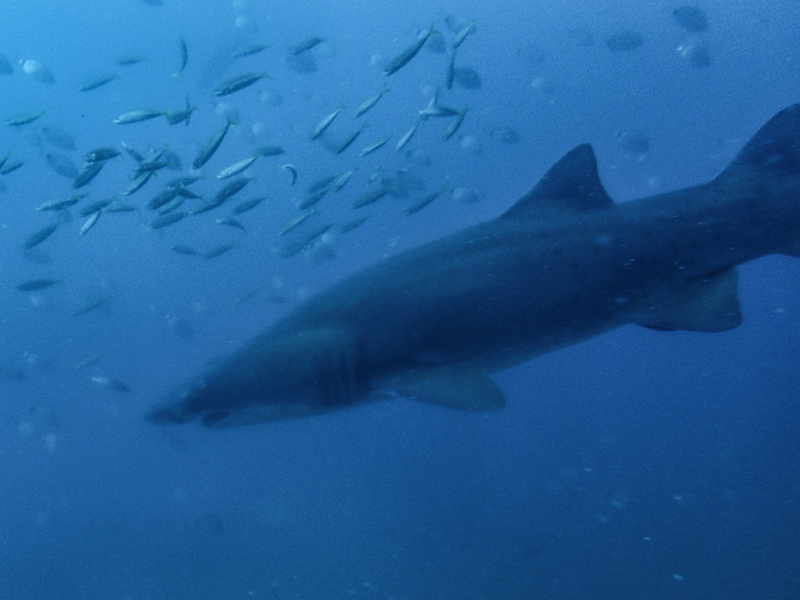 Shark attacks on humans are rare, and fatal attacks are freakishly rare — about ten a year worldwide. The risk of being killed in a shark attack is substantially less than being struck by lightning, or by an elephant. Also, as I learned this week, way less than the risk of being killed by a dog. Why do most people fear them so much more intensely than, say bears or lightening? 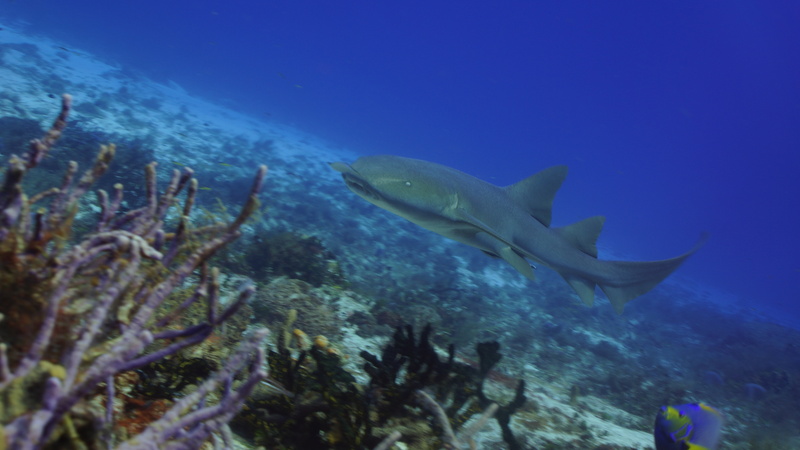 Shark phobia runs deep, and it’s unfortunate both for sharks that become victims of humans (100 million a year) and for humans who experience pointless fear rather than rapturous awe. 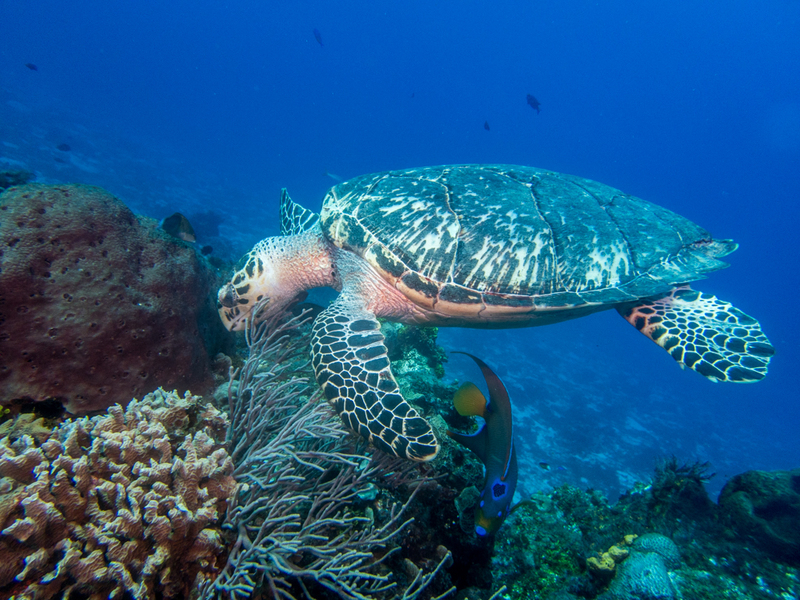 On this trip I tried underwater photography with a beginner-level underwater camera by Sea Life. I was glad I’d waited till I was reasonably competent as a diver to try this, because it could distract from doing the things that have got to be done in diving and enjoying the basic experience. But I was ready to give it a shot. 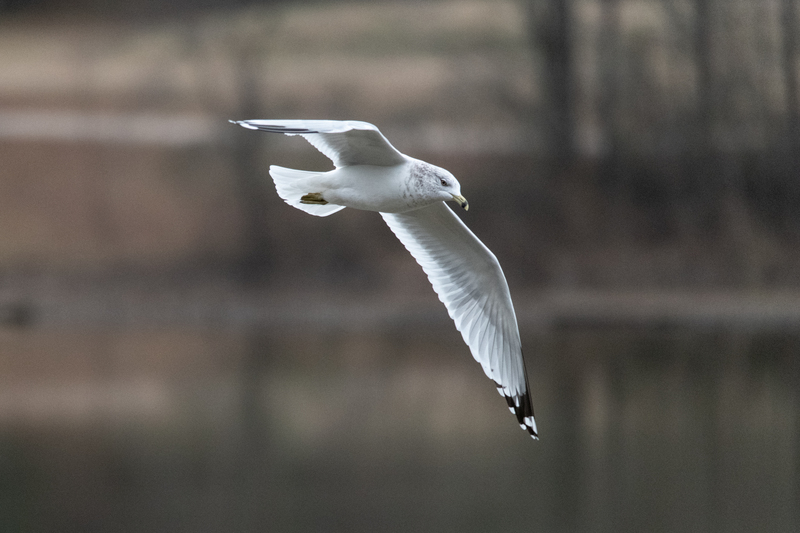 Most of the images I got were not great, but I liked a few, and I had fun hunting for interesting things and fun looking at them afterwards. 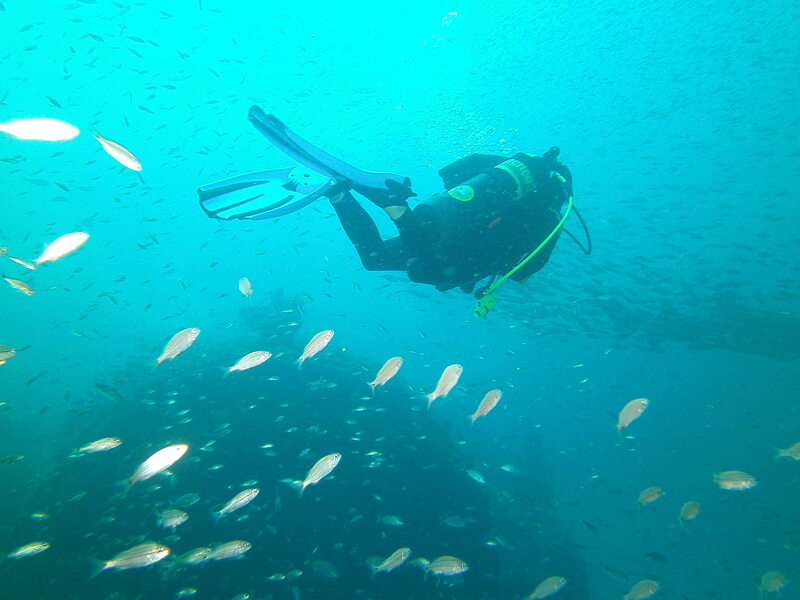 NC wreck diving involves boat rides to the ship wrecks. Our longest trip, to the Proteus, took about two and a half hours. I wasn’t looking forward the boat ride part of the experience, but we had good weather — mostly clear skies and calm seas. 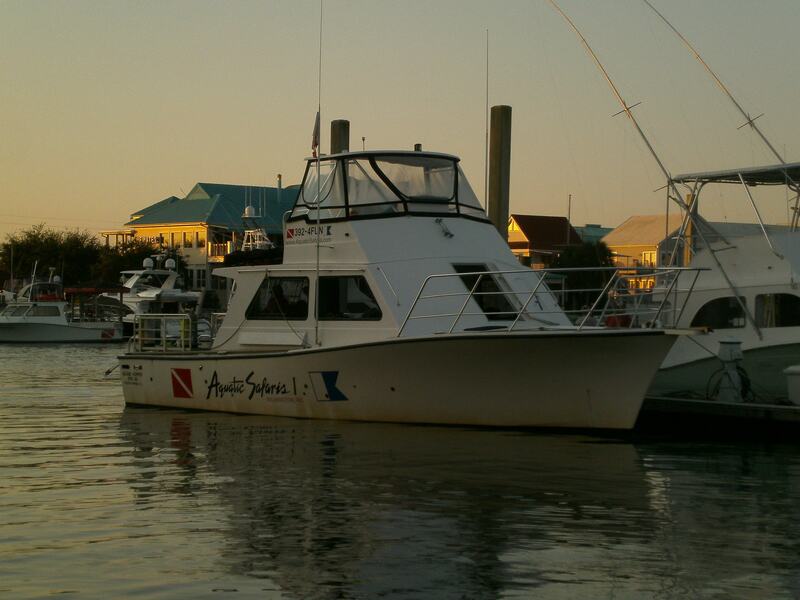 Our vessel, the Under Pressure, was a 41 foot former commercial fishing boat that was substantially unfitted to accommodate six diving customers. It had a special lift on the back of the boat to haul out divers. Once well offshore, out of sight of land, I was struck by how horizontal the landscape was. 360 degrees of flatness. At the same time, the quality of the water, its color and its energy kept changing. We saw flying fish, jumping dolphins, and one sea turtle on the surface. 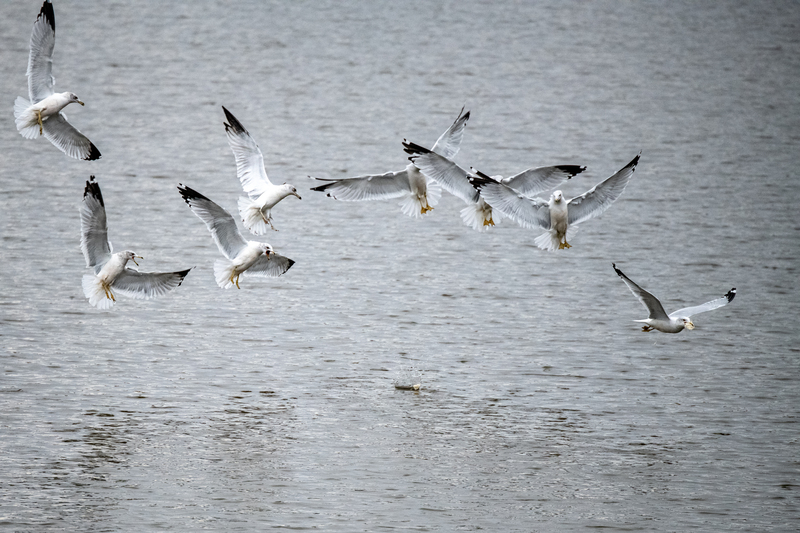 There were various gulls, pelicans, terns, and other sea birds. I spent part of the travel time recalling some of the great poems of Yeats, Frost, and Stevens. 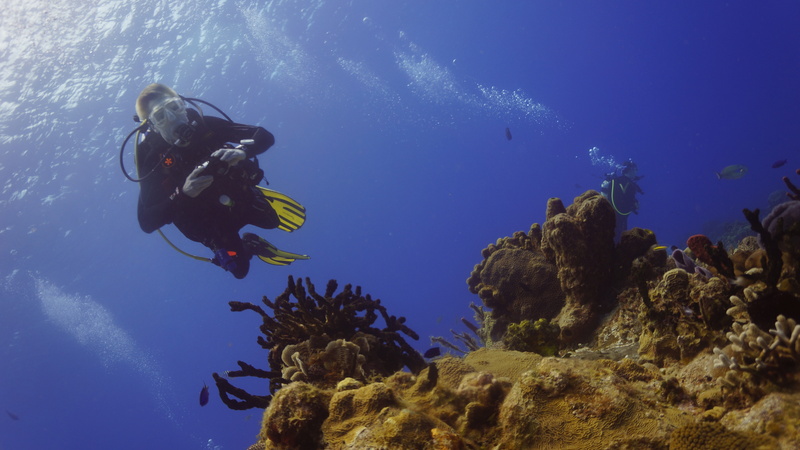 Visibility for most of our dives was good — more than 70 feet. 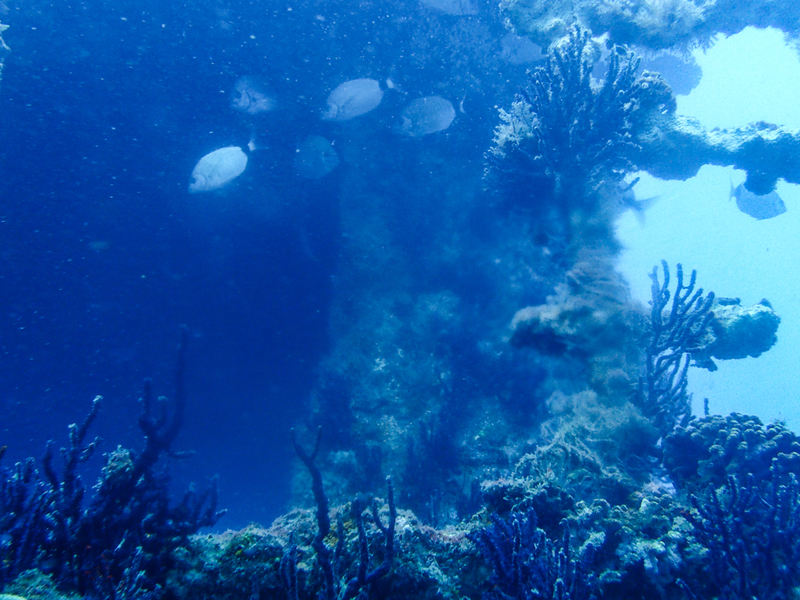 Our deepest dive, to the Proteus, was about 120 feet down. Bottom temperature was around 80. Current and waves were minimal for the first three days, though more challenging for the final day. I had an oxygen leak (which turned out to be from my BC inflator), which required me to cut the dive short and to ask Sally to share her air as we came back. Fortunately, she agreed. It was a learning experience. Speaking of learning, I need to give a special shout out to Scott Powell, owner of Down Under Surf and Scuba, who organized the trip, led our group, and taught my course in wreck diving. Scott is a diving professional of the highest caliber, but he seems to really enjoy helping those of us less accomplished. He’s one of those rare gifted teachers that just loves his subject, never make you feel inferior, but make you excited about getting better. 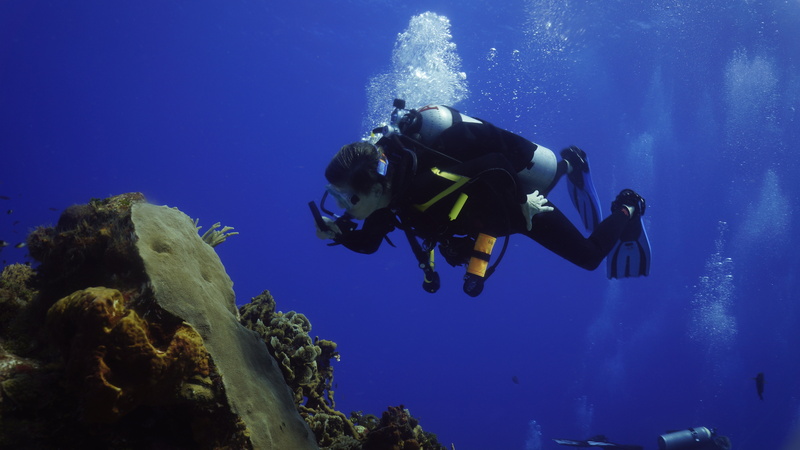 His passion and enthusiasm for diving are infectious and inspiring.